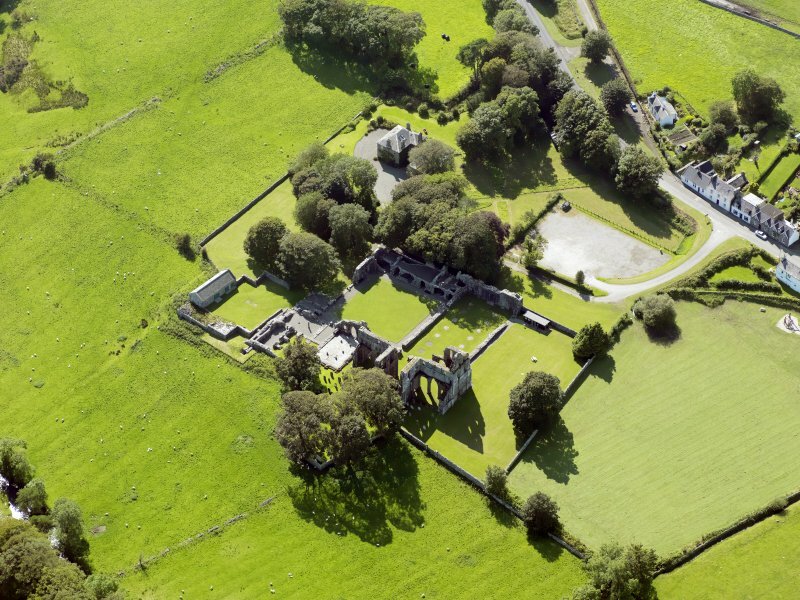 Oblique aerial view of Dundrennan Abbey. 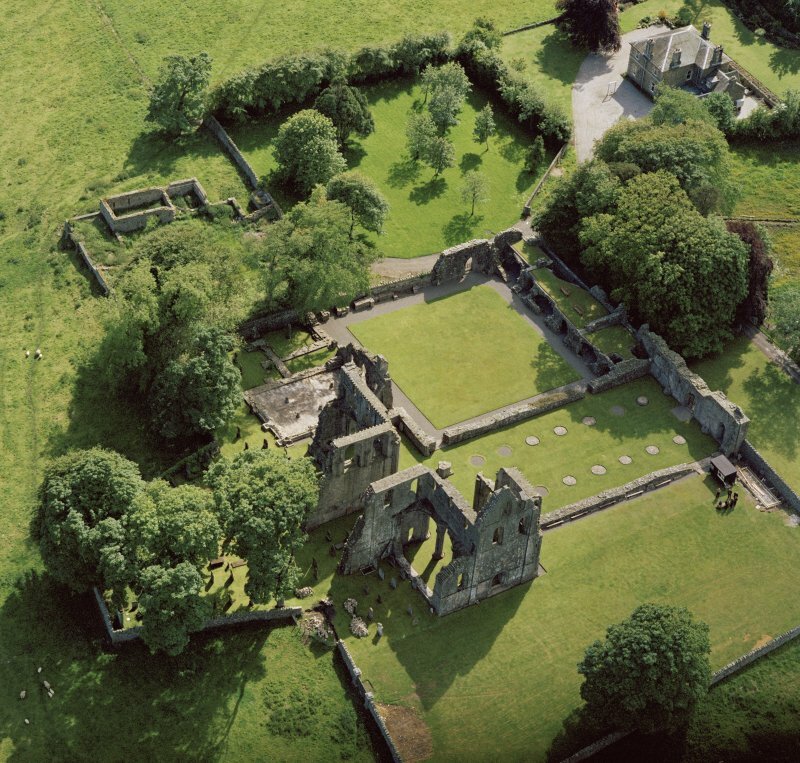 Oblique aerial view of Dundrennan Abbey, taken from the SE. Interior. 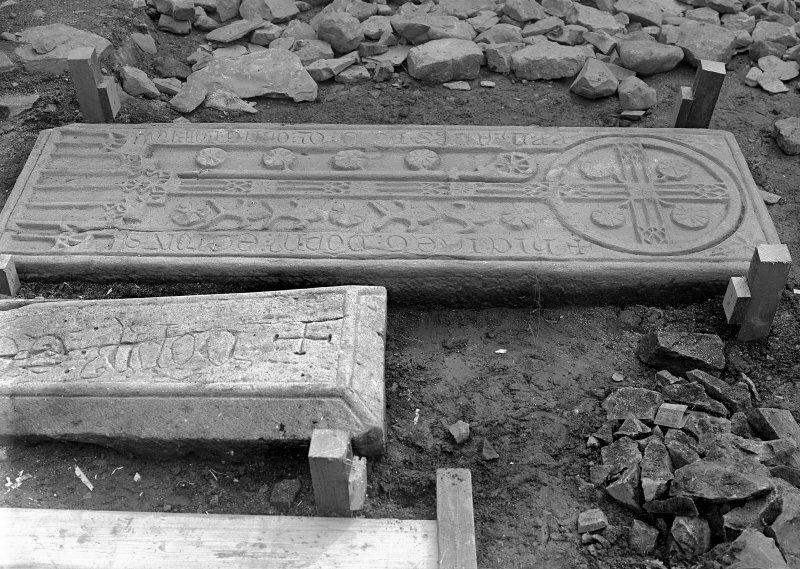 Detail of grave slabs. Interior. 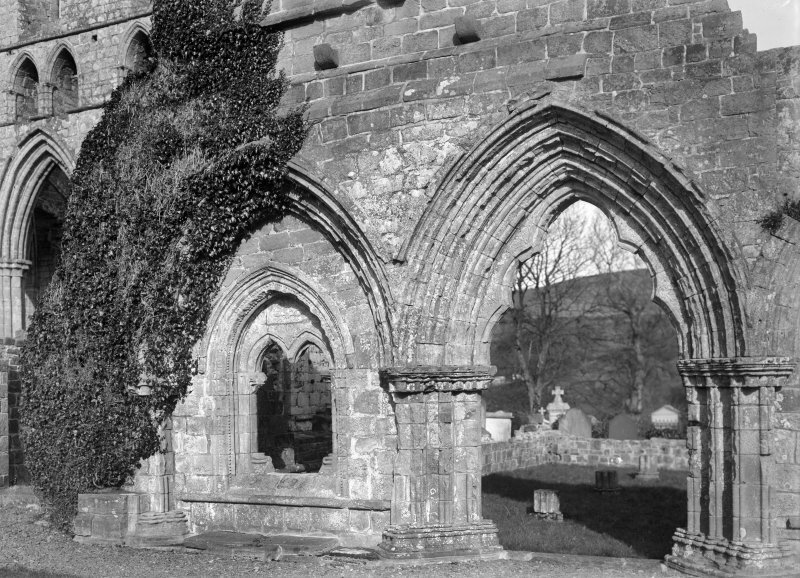 Chapter house, view to cloister garth. 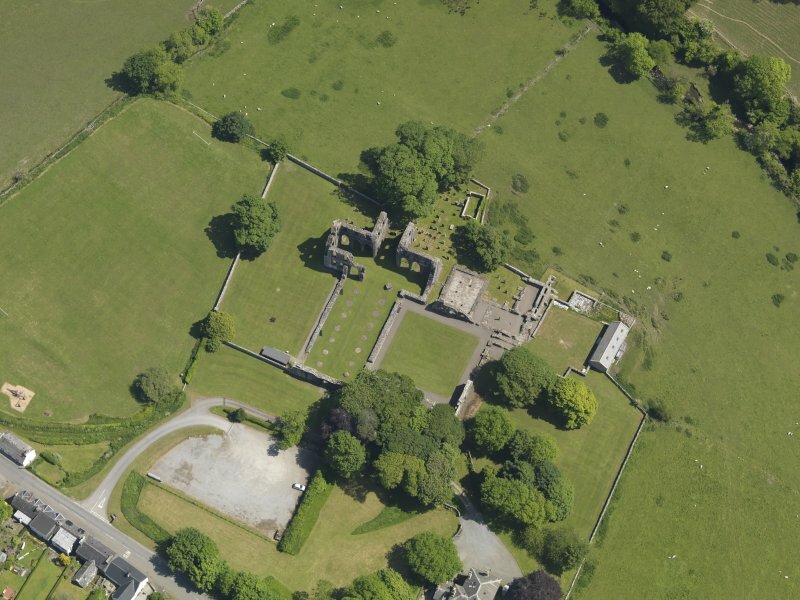 Oblique aerial view of Dundrennan Abbey, taken from the SSW. 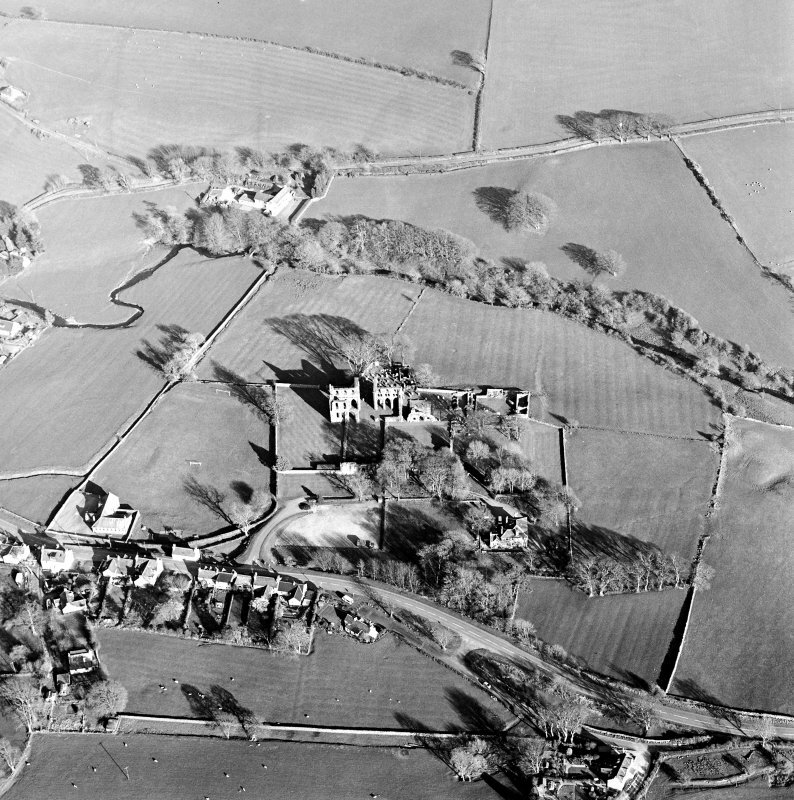 General oblique aerial view of Dundrennan Abbey, taken from the SE. 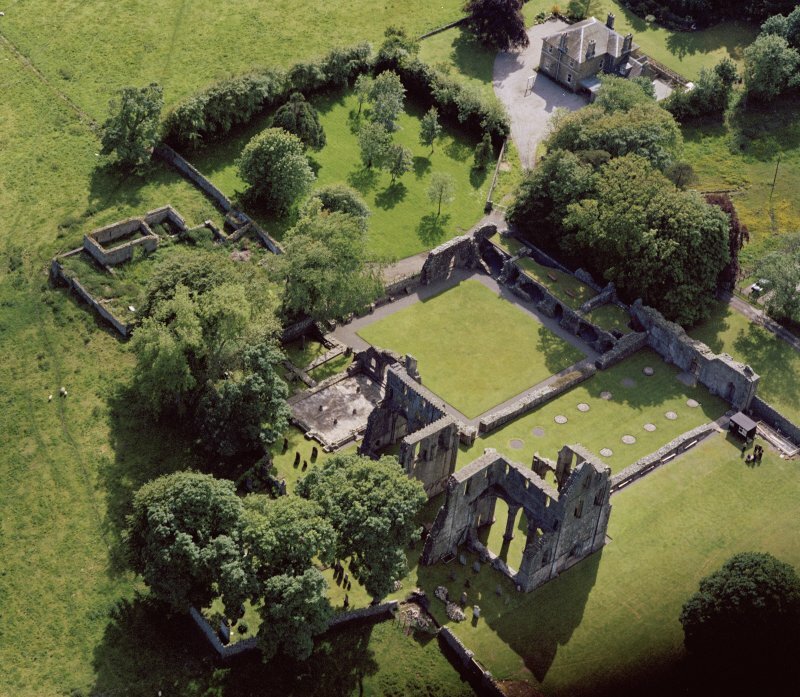 Oblique aerial view of Dundrennan Abbey, taken from the ENE. 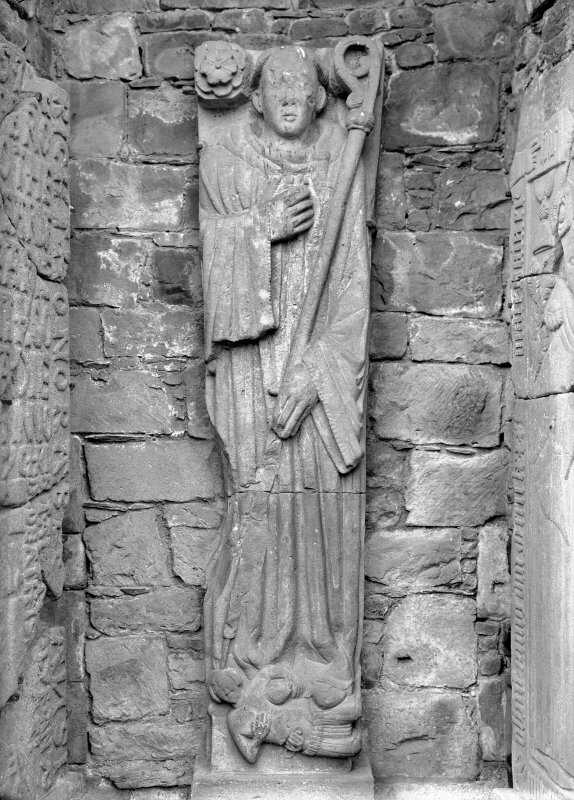 Detail of Abbot's monument effigy, Dundrennan Abbey. Interior. 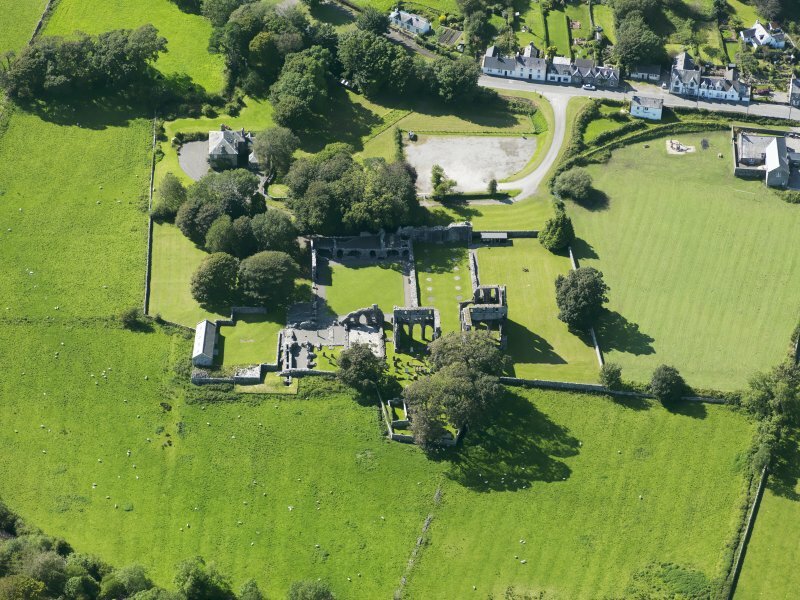 View of S transept from E.
General oblique aerial view of Dundrennan, taken from the W.
General oblique aerial view of Dundrennan, taken from the WSW. 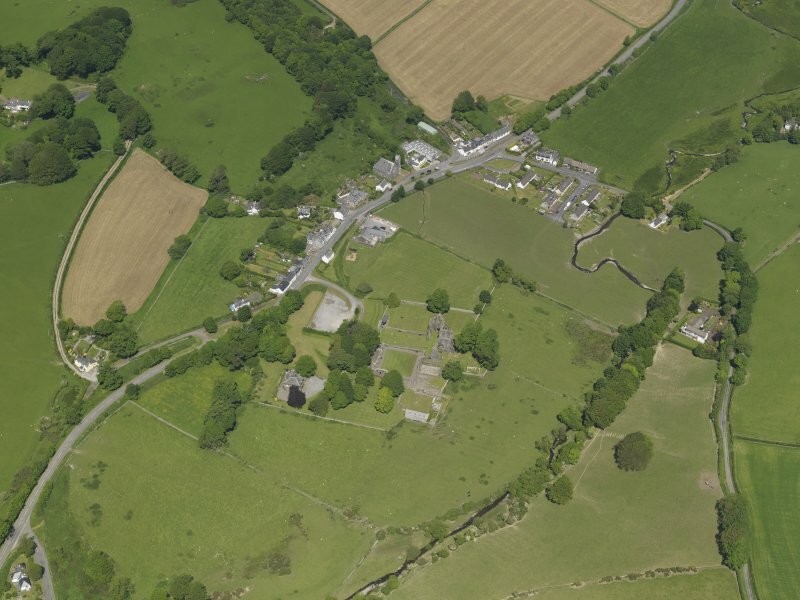 General oblique aerial view of Dundrennan, taken from the NNE. 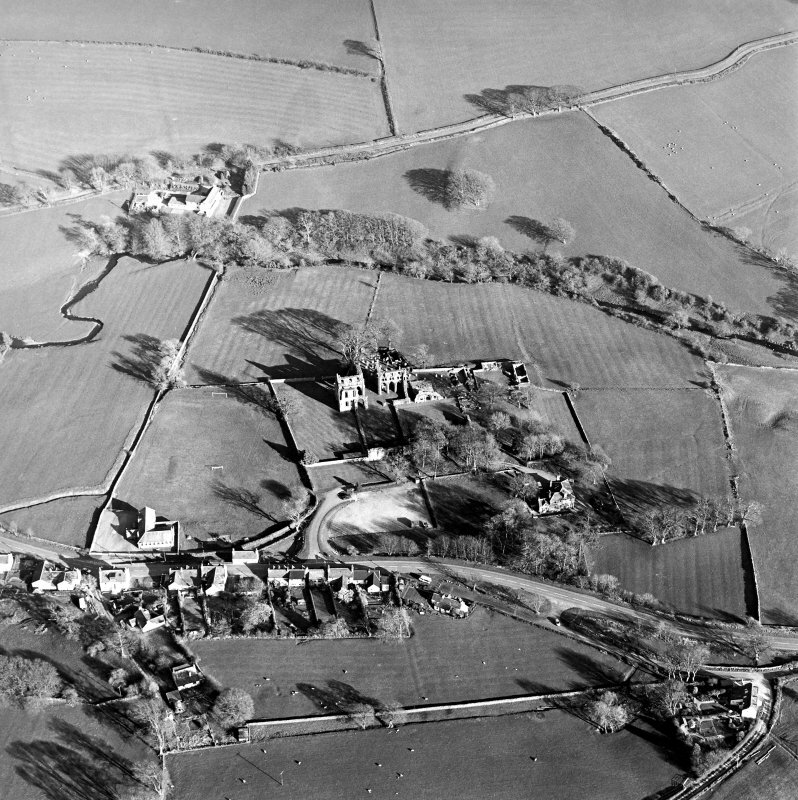 Oblique aerial view of Dundrennan Abbey, taken from the NE. 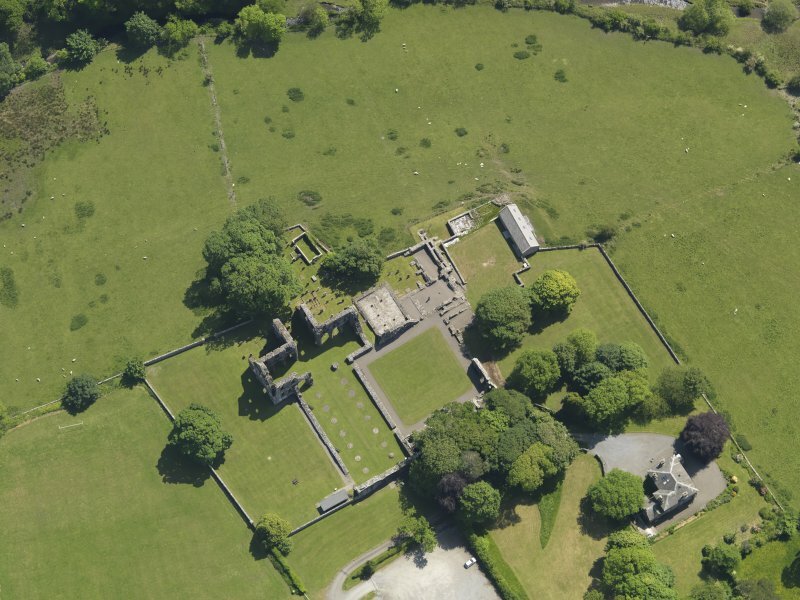 General oblique aerial view of Dundrennan Abbey, taken from the WNW. 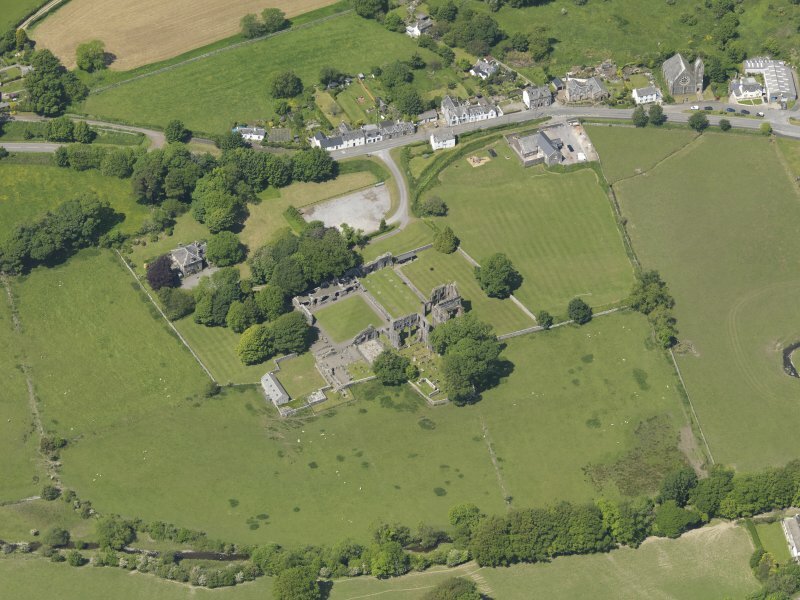 General oblique aerial view of Dundrennan Abbey, taken from the ESE. 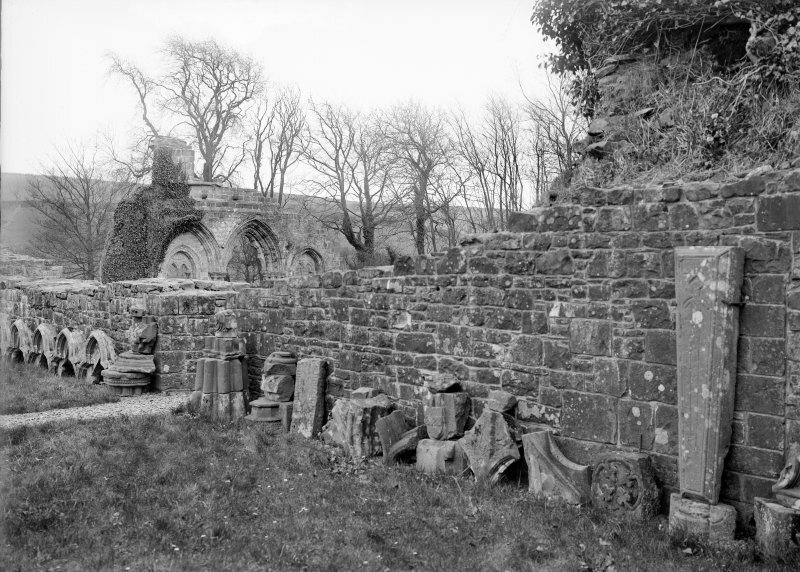 Detail of side elevation, Dundrennan Abbey. 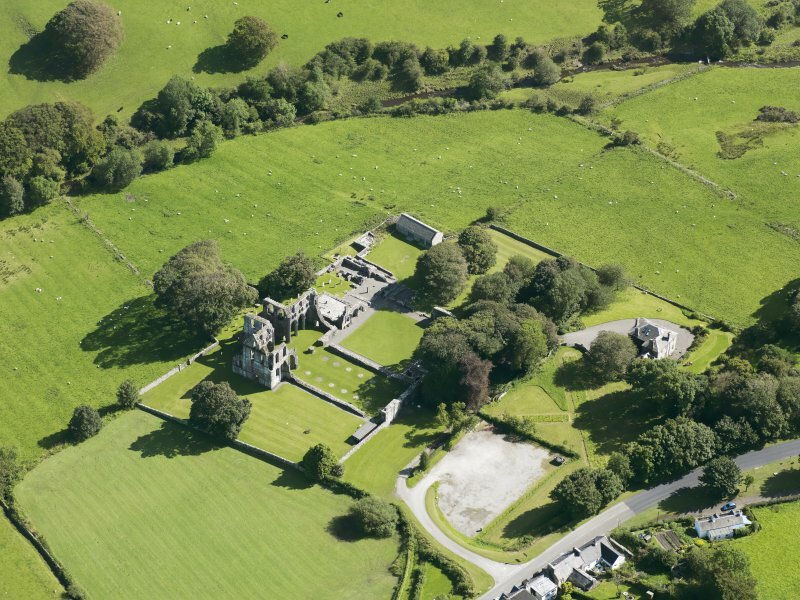 View of W range from W.
Oblique aerial view of Dundrennan Abbey, taken from the SW.
Oblique aerial view of Dundrennan Abbey, taken from the W.
General oblique aerial view of Dundrennan Abbey, taken from the NNW. 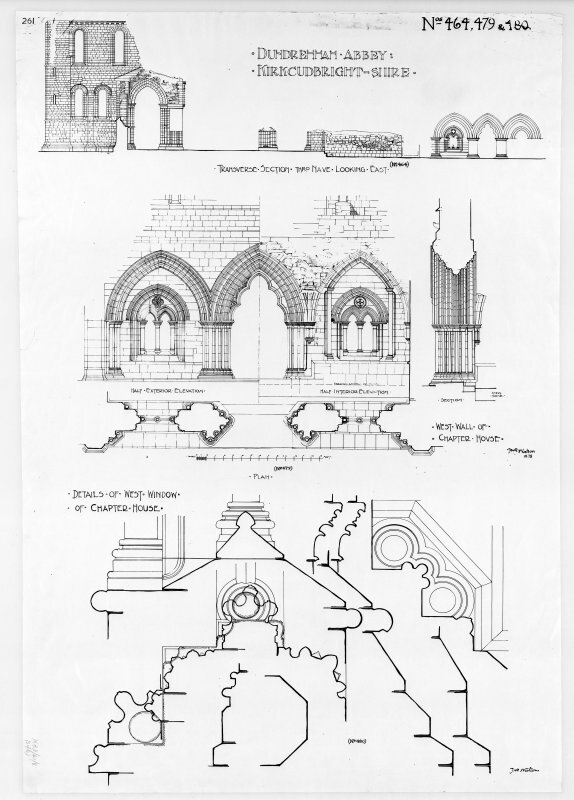 Photographic copy of section, elevations and details of chapter house. 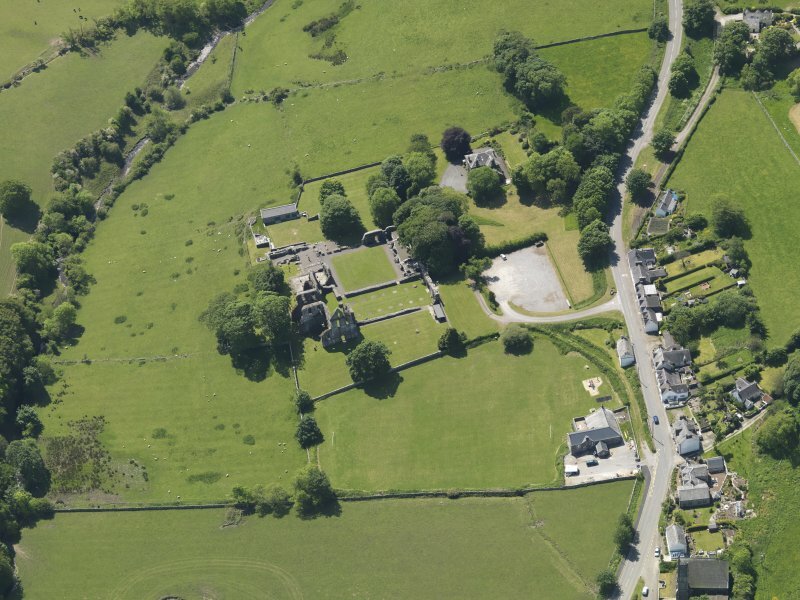 Oblique aerial view centred on the abbey and manse, taken from the S.
Oblique aerial view centred on the abbey and manse, taken from the W.
Detail of tombstone and slab of Lady of Orchardton. Interior. View of chapter house. 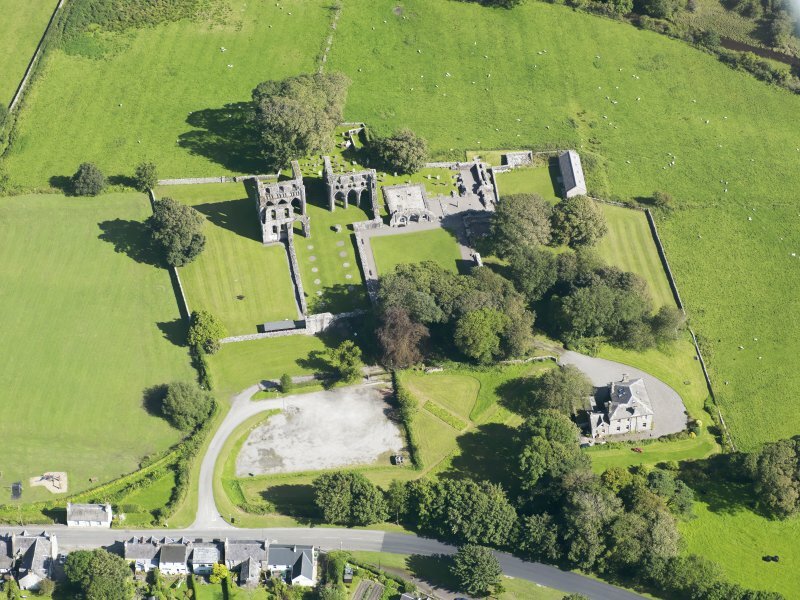 Oblique aerial view of Dundrennan Abbey, taken from the NW. 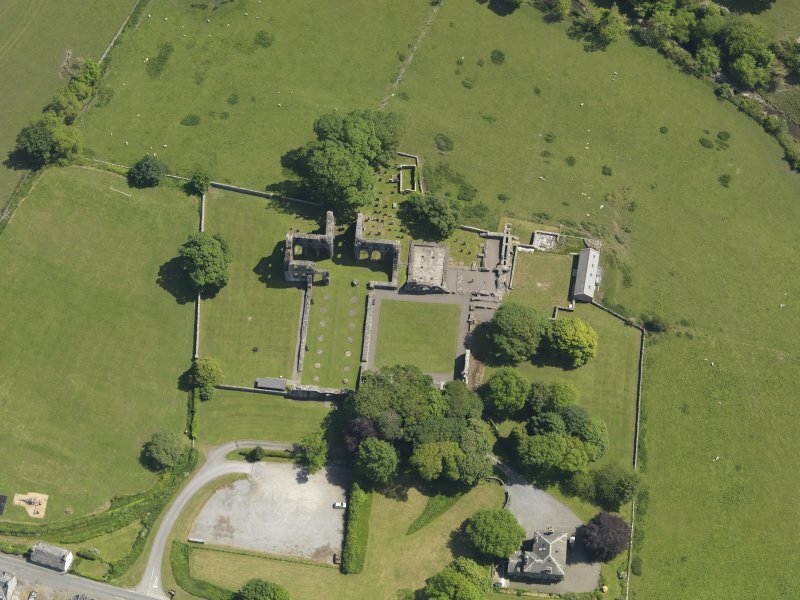 Oblique aerial view of Dundrennan Abbey, taken from the NNW. Detail of stone screen fragments. Interior. Detail of tomb sculpture. View of choir from SE. Interior. Chapter house, view of column base. 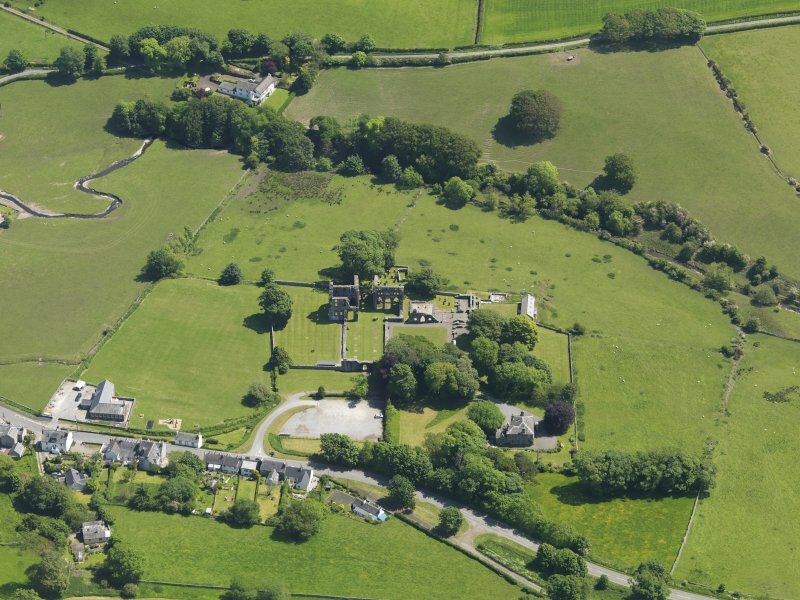 General oblique aerial view of Dundrennan, taken from the N.
Oblique aerial view centred on the abbey and manse, taken from the WSW. 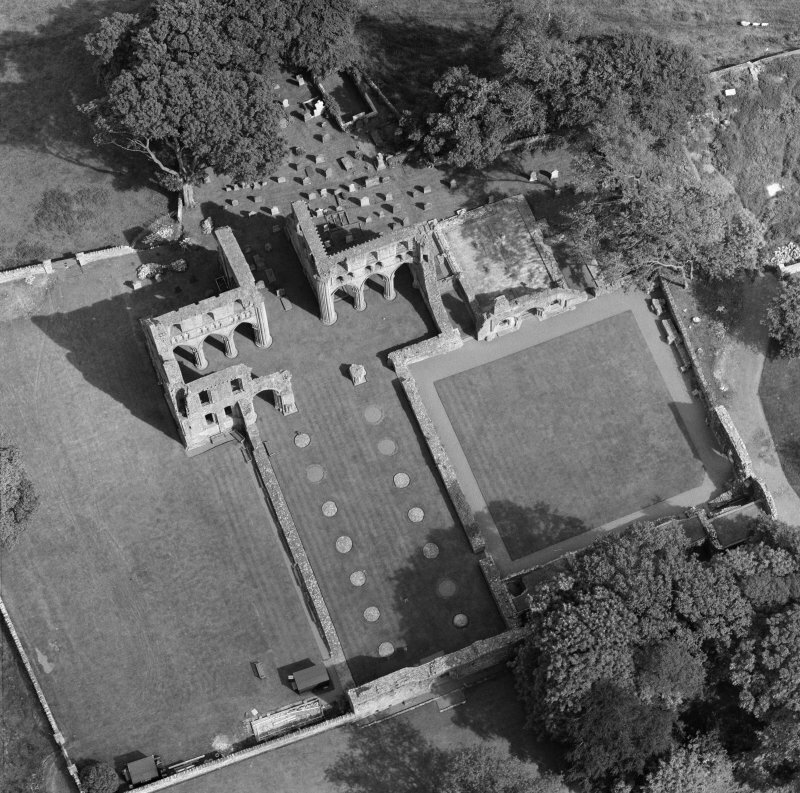 Oblique aerial view centred on the abbey and manse, taken from the WNW. 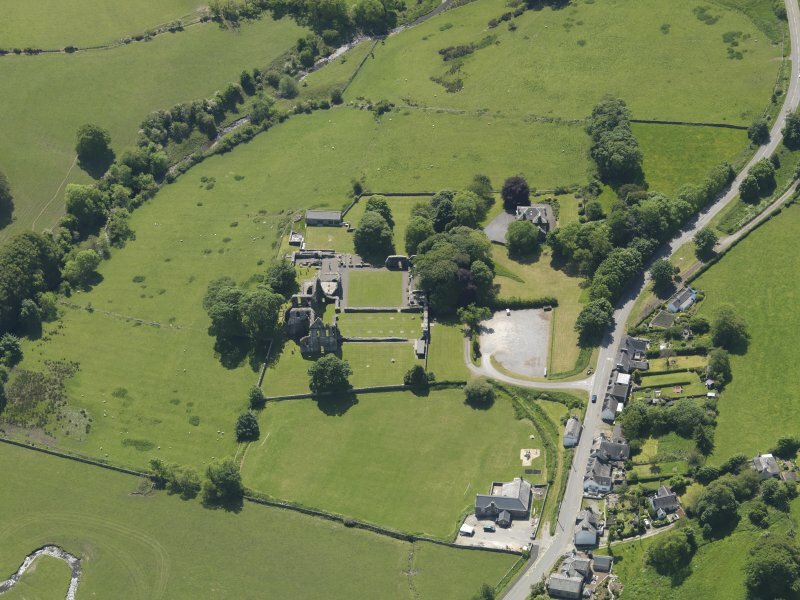 Oblique aerial view centred on the abbey and manse, taken from the SSE. 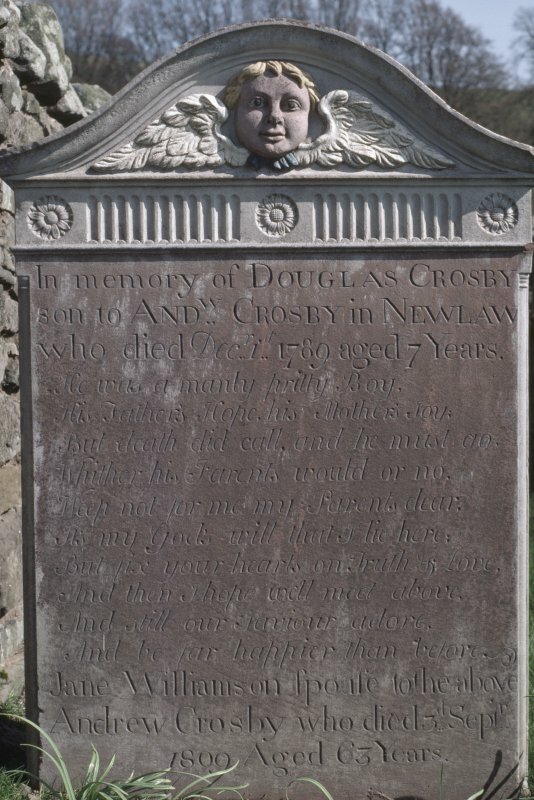 View of headstone to Douglas Crosby d. 1789 aged 7 years, Dundrennan Abbey graveyard. View of chapter house entrance. Interior. N transept, view of monument. View of chapter house from SE. 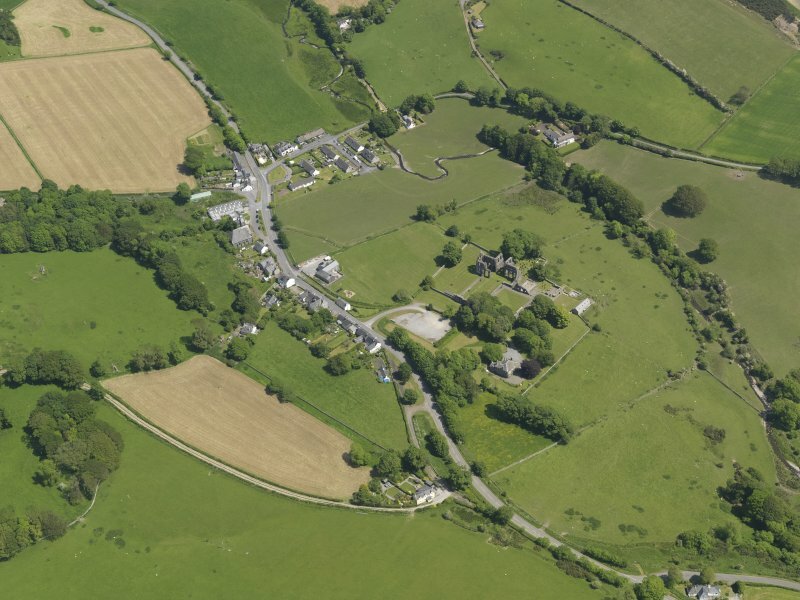 View of W range from S.
General oblique aerial view of Dundrennan, taken from the ESE. 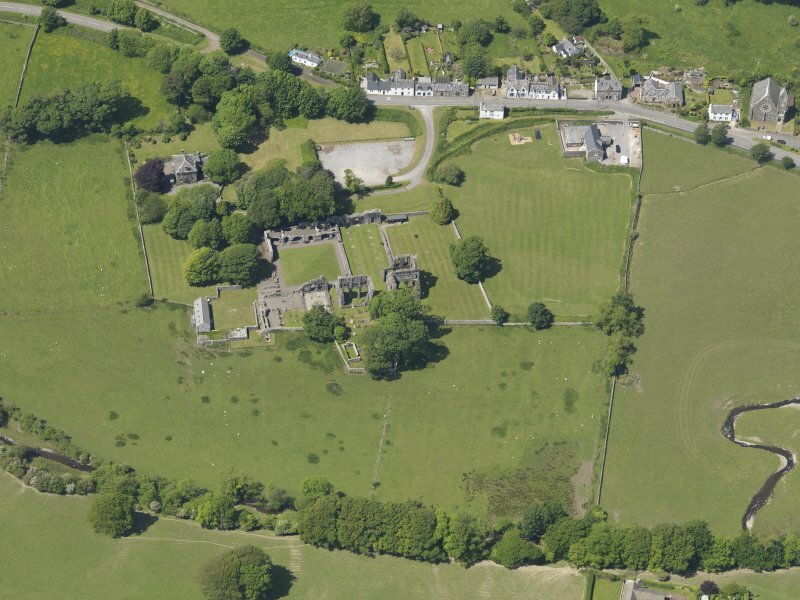 General oblique aerial view of Dundrennan Abbey, taken from the N.
General oblique aerial view of Dundrennan Abbey, taken from the NNE. 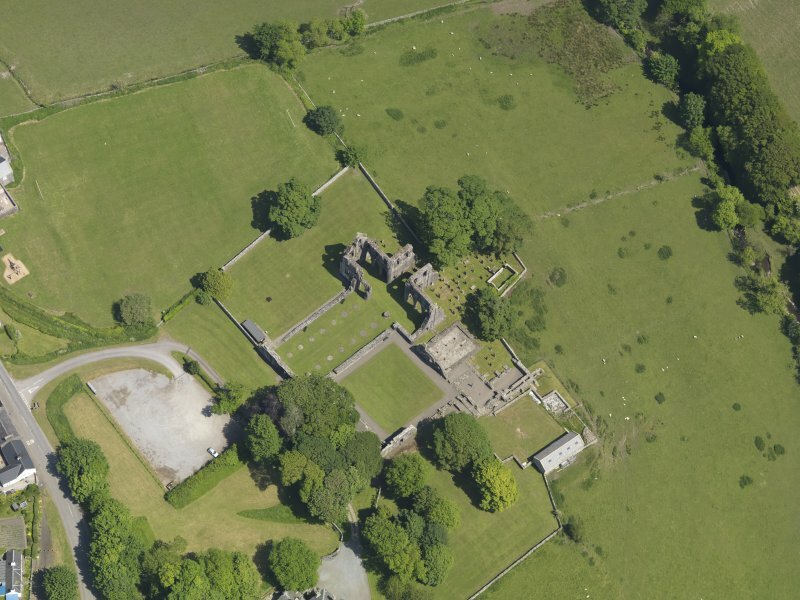 Oblique aerial view centred on the abbey and manse, taken from the SW.
Oblique aerial view of Dundrennan Abbey, taken from the WSW. Interior. Detail of Galloway's tomb effigy. 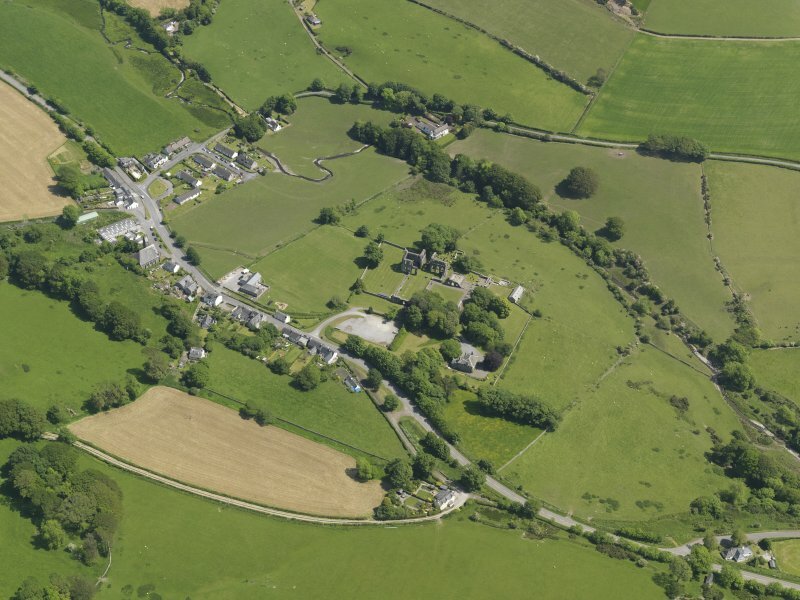 General oblique aerial view of Dundrennan, taken from the SSE. 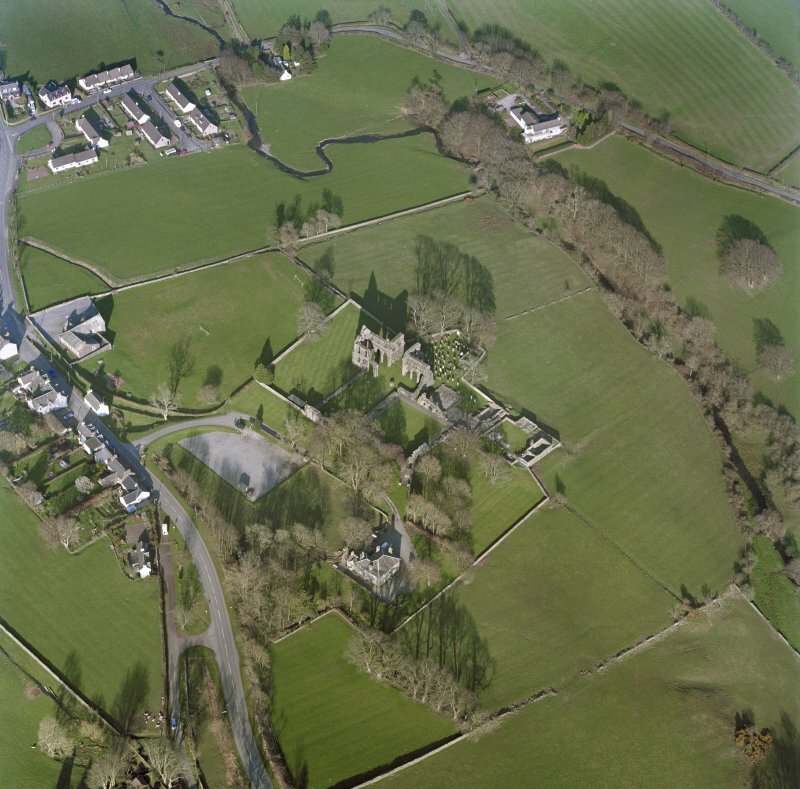 General oblique aerial view of Dundrennan Abbey, taken from the ENE. 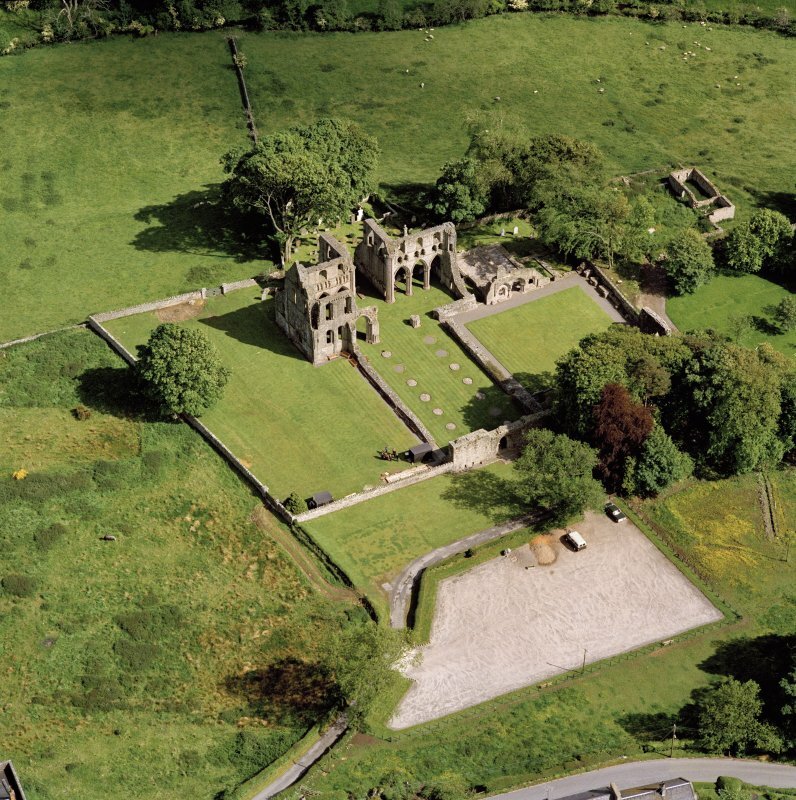 Oblique aerial view of Dundrennan Abbey, taken from the WNW. 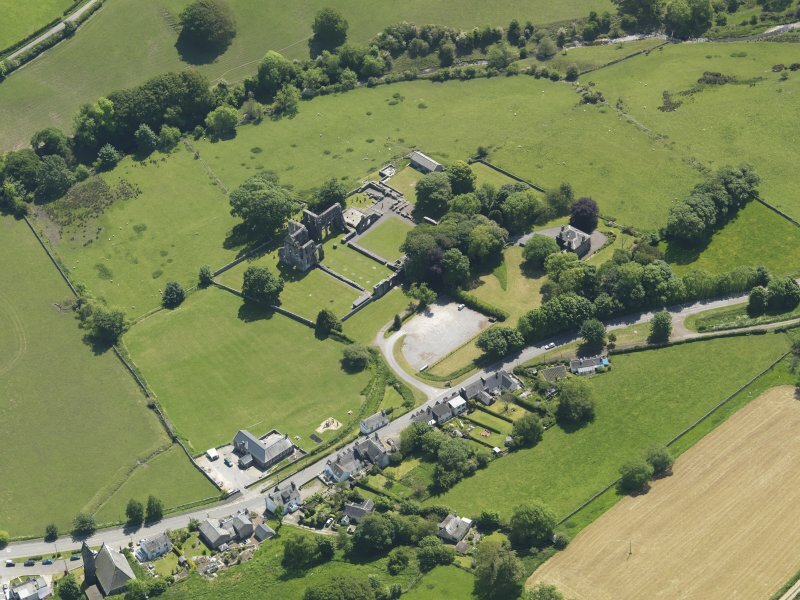 Oblique aerial view of Dundrennan Abbey, taken from the ESE. 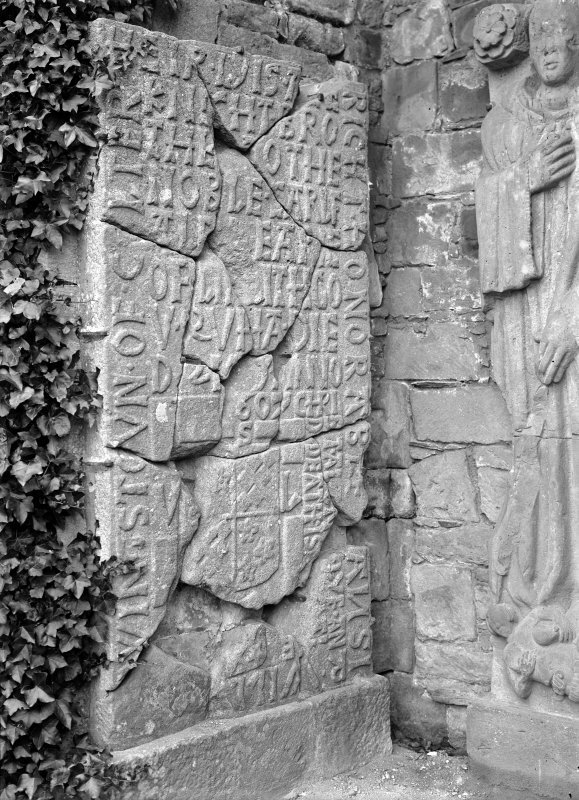 Detail of monument of Abbots Egidius, Dundrennan Abbey. 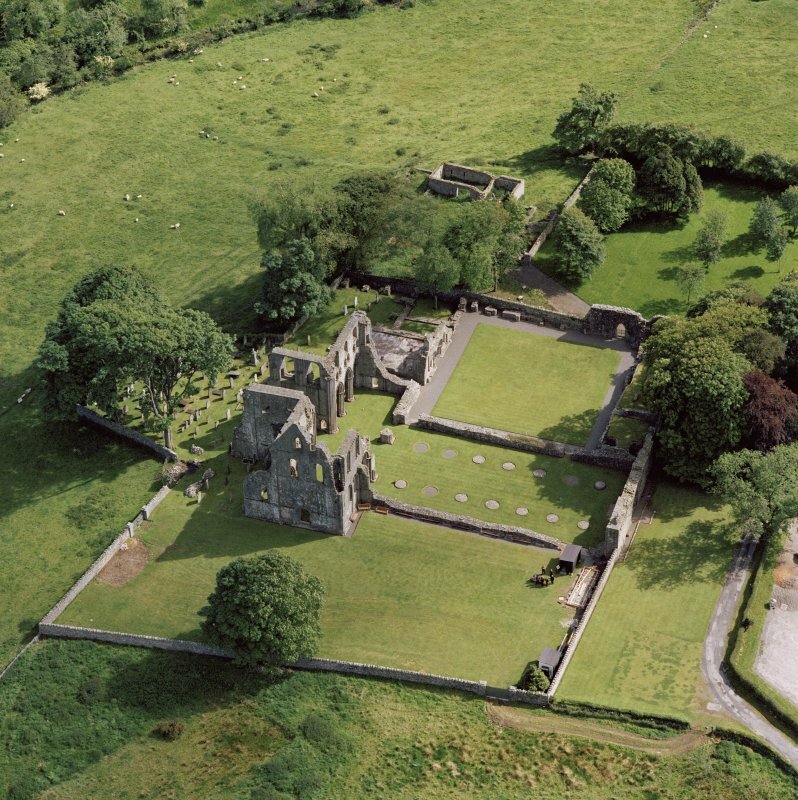 The Cistercian Abbey of Dundrennan. Full descriptions and plan by Richardson. 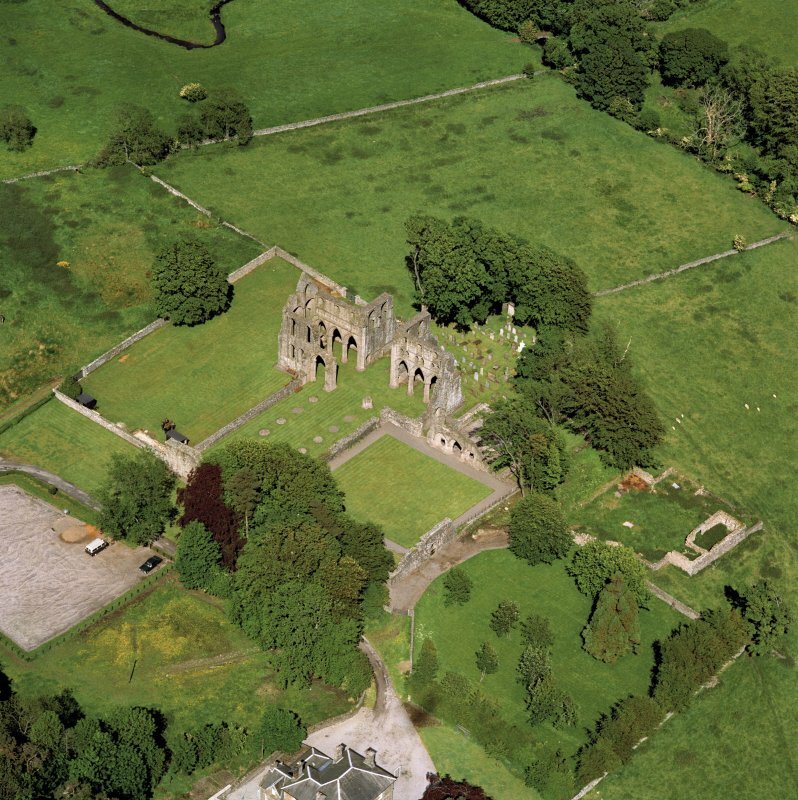 The Abbey is as described in the Official Guide. Archeol. Coll. of Ayrshire & Galloway, Vol 10, 1894 - plans interior details etc. 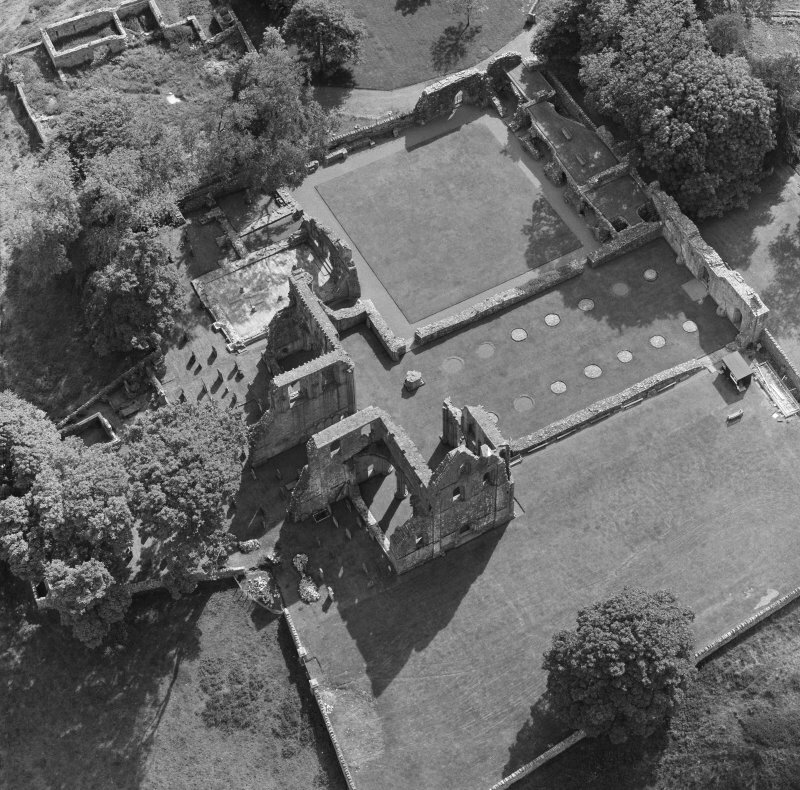 Oblique aerial photographs of Dundrennan Abbey taken by Mr John Dewar in 1972. 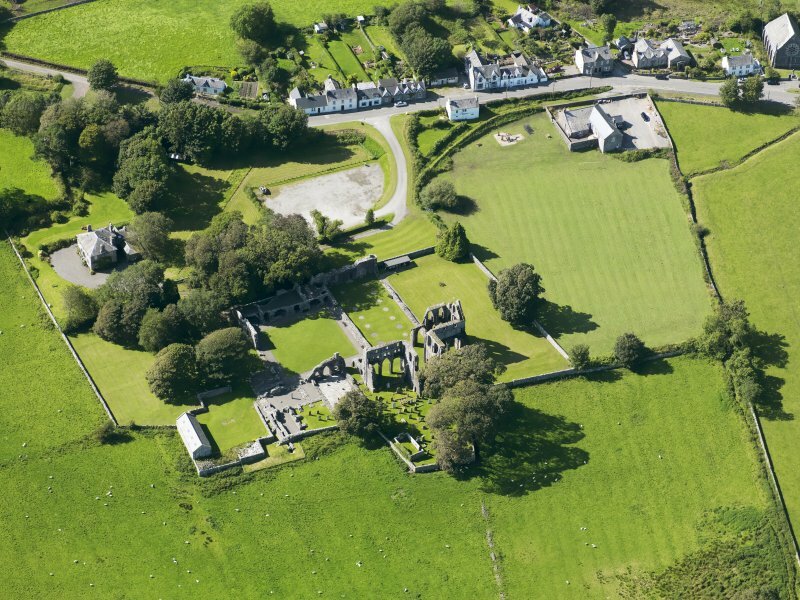 Although a mere fragment of its former grandeur, the architecture of Dundrennan Abbey is the most accomplished piece of medieval workmanship in the province. 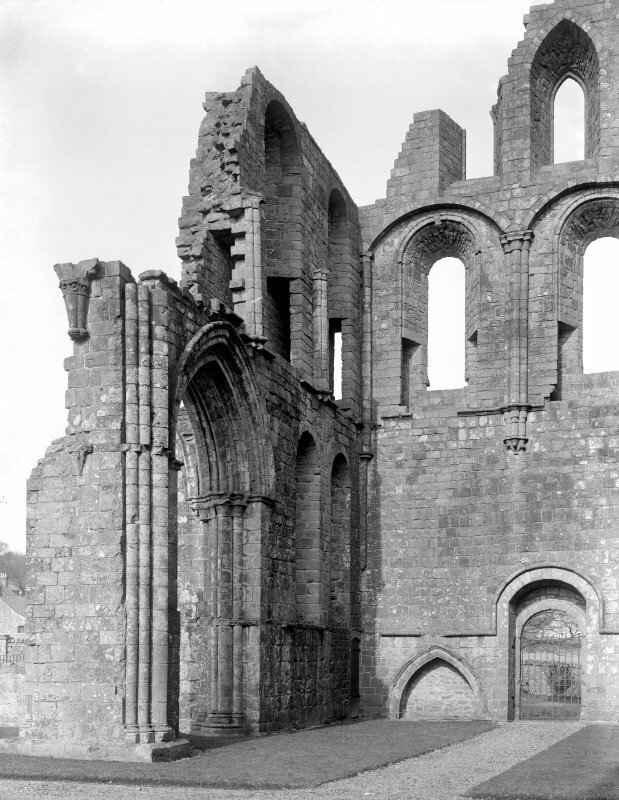 The first two of its three main building phases are almost a text-book demonstration of the transition from round-arched Romanesque to pointed Early Gothic styles. 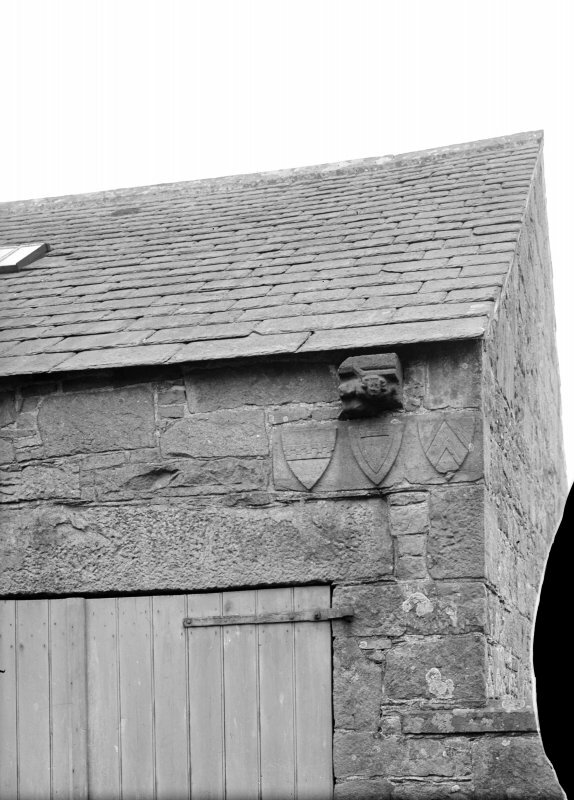 How building work of this quality was organised and funded in the heart of semi-independent Galloway in the middle and later decades of the 12th century are questions to which we can only dimly perceive the answers. 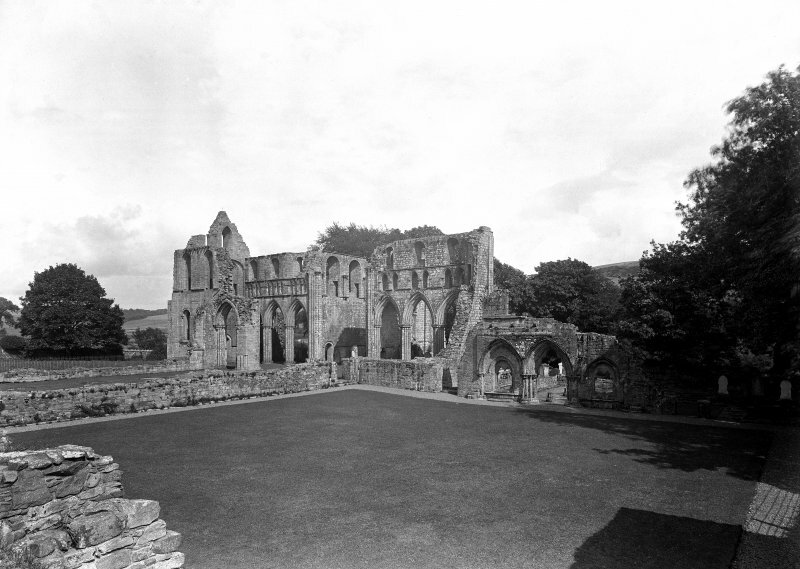 Its foundation in about 1142 as a daughter-house of Rievaulx Abbey in Yorkshire must have been to the mutual political advantage of King David I, Fergus, Lord of Galloway,and the Cistercians themselves. 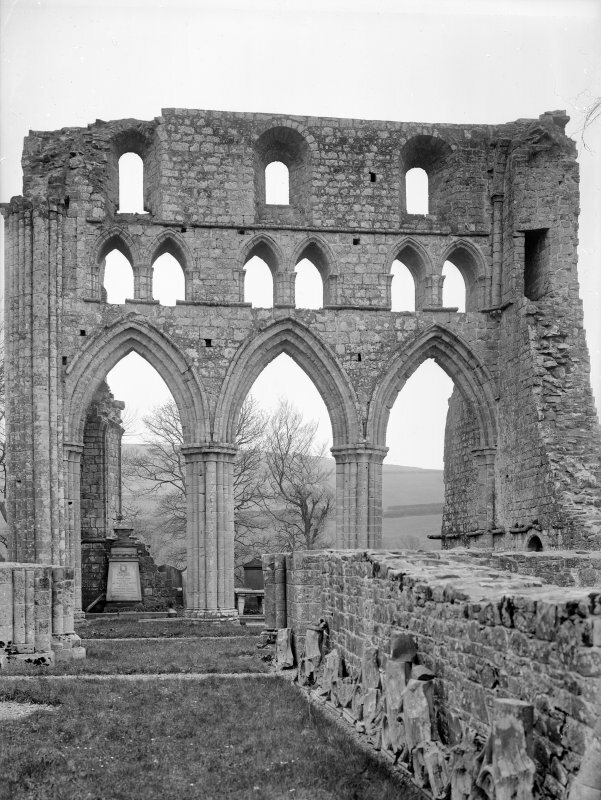 A letter of 1165 refers to Dundrennan 'as the abbey which the brethren of Rievaulx built', no doubt perpetuating the skills developed in the completion of the church at Rievaulx itself The later 12th century work, however, shows closer stylistic affmities with other Yorkshire Cistercian monasteries, and these operations were presumably afforded by the wealth of its own estate. 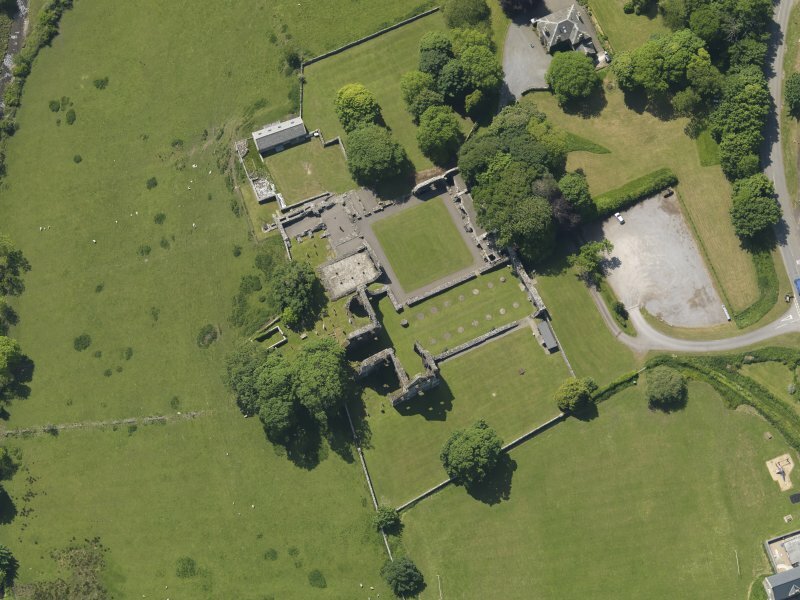 It probably enjoyed a generous landed endowment (including lands in Ireland) from the native lords of Galloway, the last of whom, Alan (d. 1234), was buried here, but our knowledge of the abbey's history is negligible. We can only infer that the creation of two further major dependencies (nos 71, 72) shows that Galloway was to the Cistercians' liking. 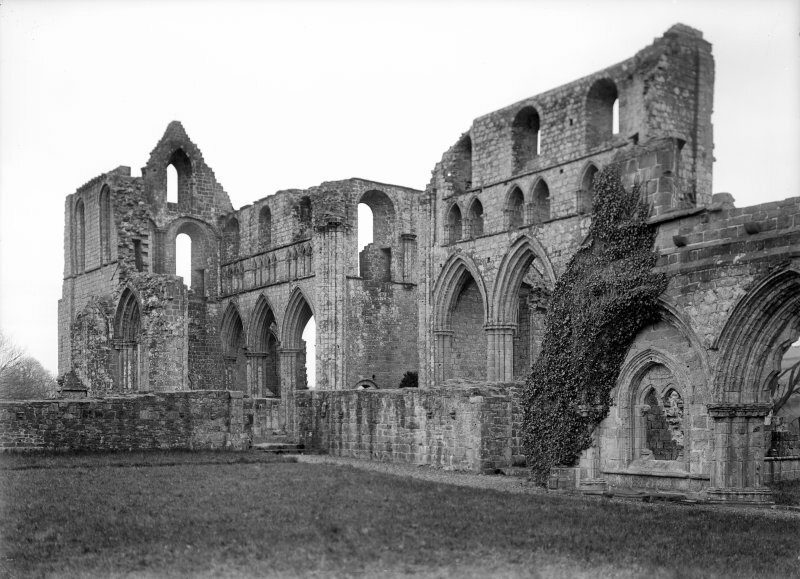 The last stages of the monastery's existence are better charted: in 1529 the abbey buildings were reputedly in a state of collapse, and at the Reformation in 1560 the convent comprised at least twelve monks. 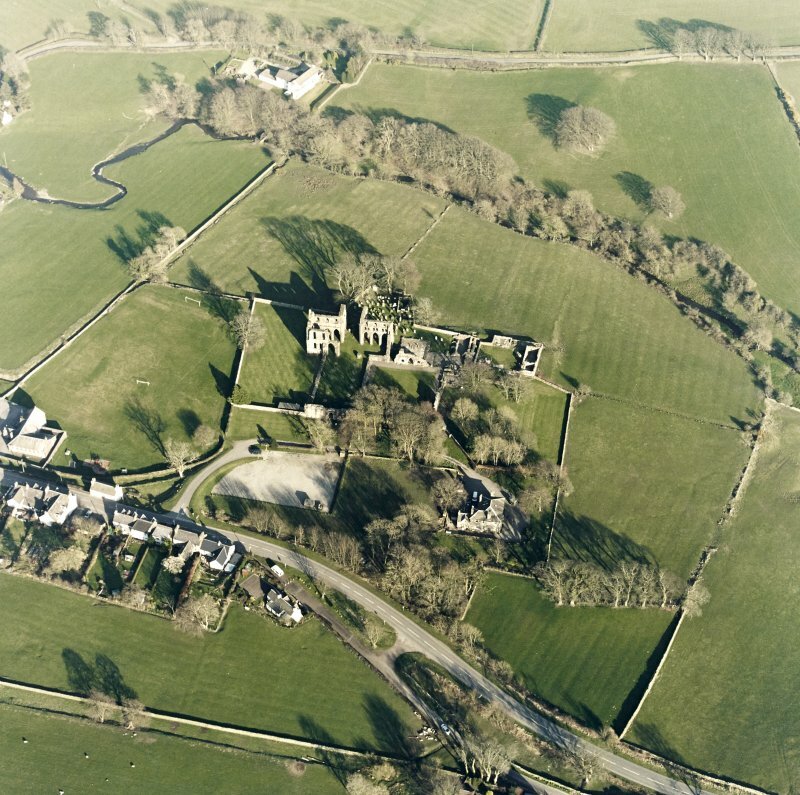 The ownership of the abbey and its estate was fully secularised in 1606 when it was formed into a lordship for John Murray, later 1st Earl of Annandale. 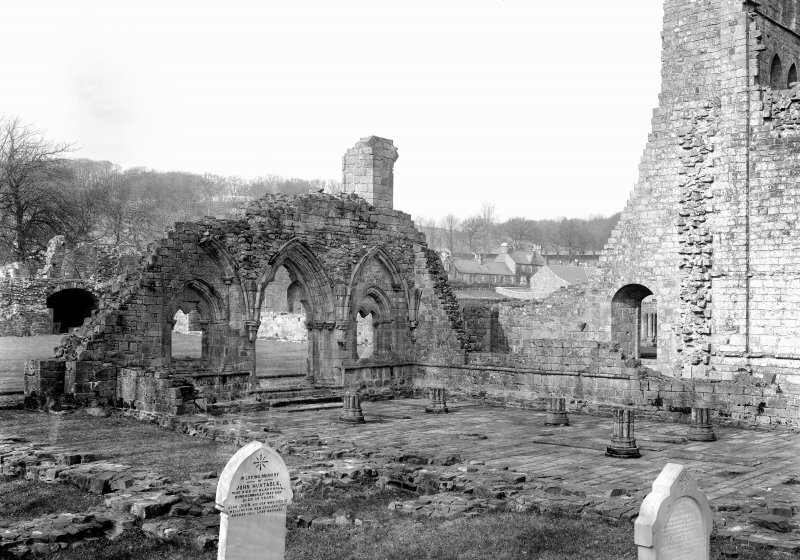 Like many monastic ruins, Dundrennan demands an effort of imaginative reconstruction. 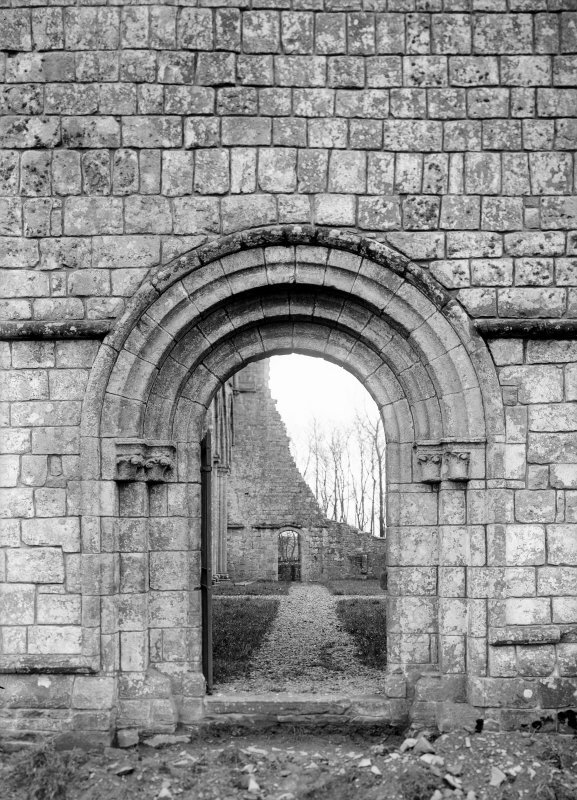 The gateway through which the visitor enters the abbey precincts used to be the central doorway at the west end of an 8-bay aisled nave, now reduced mainly to its foundations. Those portions that survive practically to full height are the north and south transept and adjacent portions of the unaisled chancel. These tell us that the first church was two-storeyed, incorporating a range of clerestorey (upper level) windows. 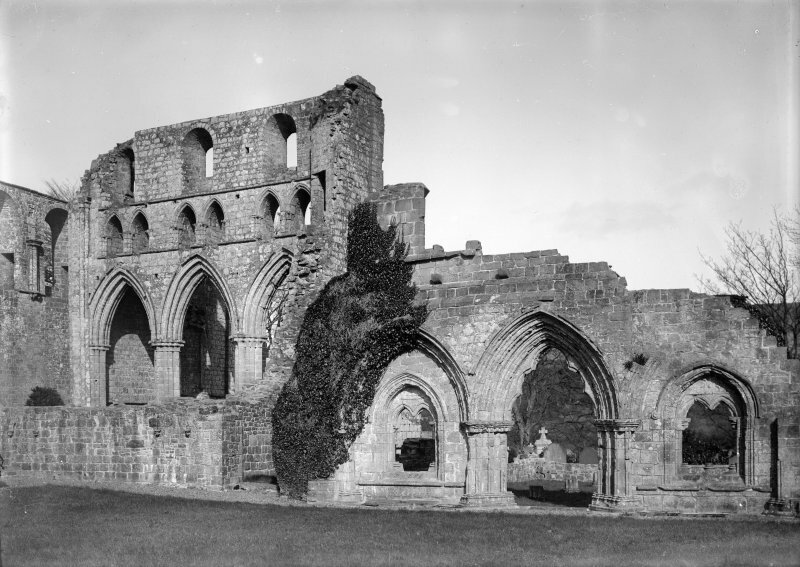 The crossing, the eastern walls of the transepts, and the chapels behind them, were then remodelled in the last quarter of the 12th century. 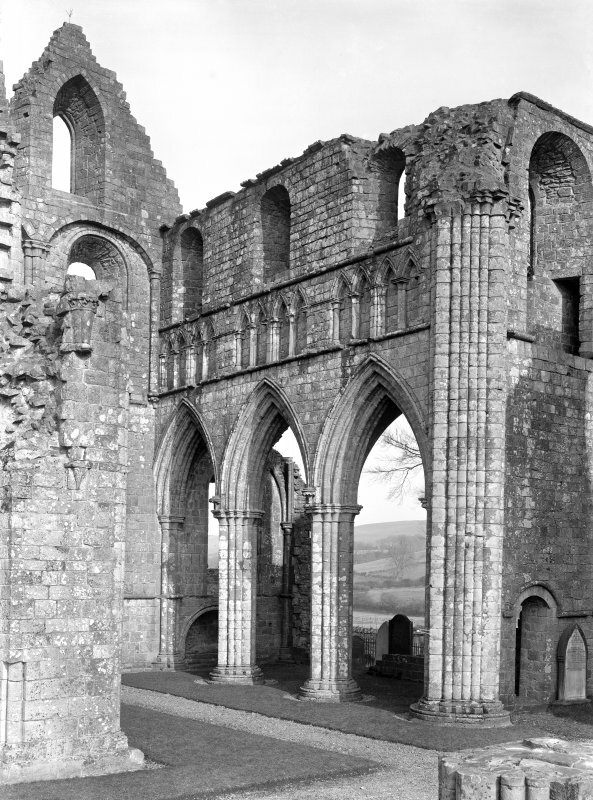 Giant three-bay arcades gave access to the chapels which were redesigned with rib-vaulted ceilings; above the arcades a triforium (middle) stage was introduced, the refmed and spacious effect being a step further away from original ascetic ideals. Primary and secondary work alike was wrought in ashlar masonry of local extraction. 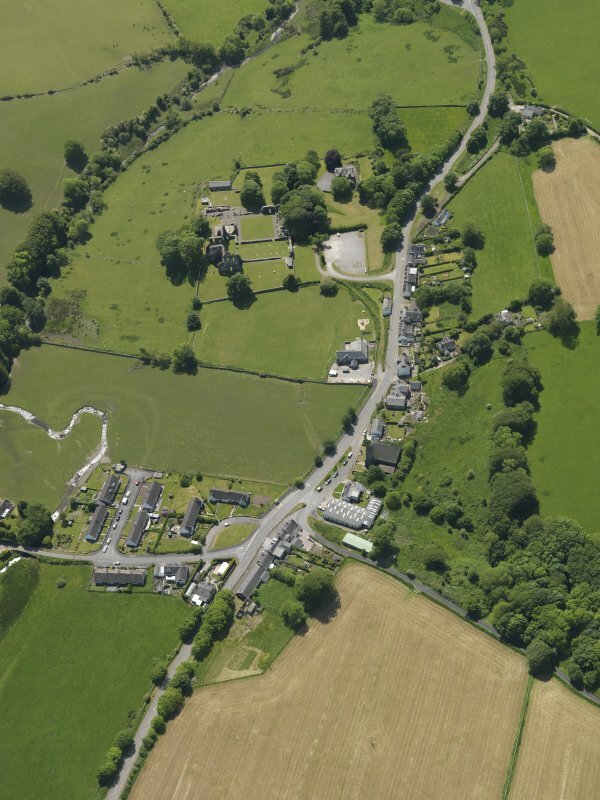 Of the claustral buildings only parts of the east and west ranges are now clearly visible. Their chief glory is the late 13th century arcaded frontage of the chapter house which has a cusped doorway and flanking two light windows. It possessed a grand aisled and vaulted interior, sub-divided into twelve vaulted compartments. 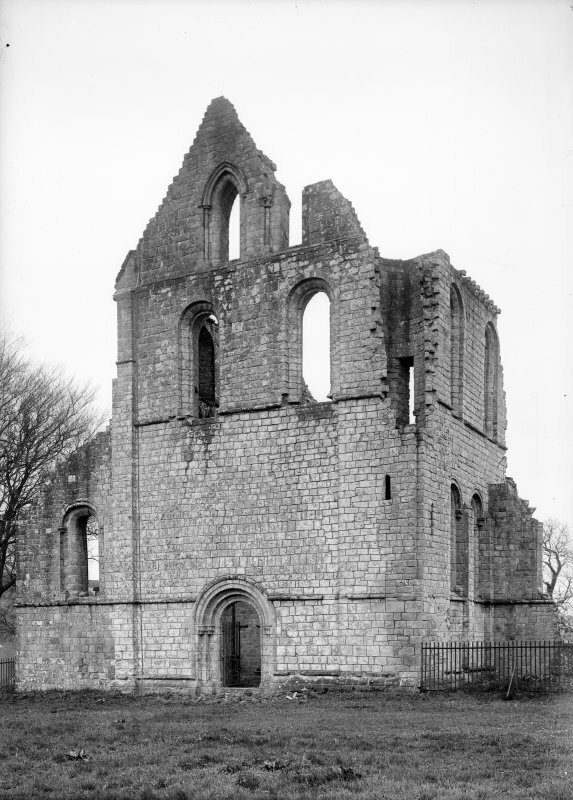 The west range, like that at Glenluce (no. 72) originally provided all the accommodation and services required by the community of lay brothers, but at a late stage was rebuilt to form a series of vaulted cellars. Parts of the cloister arcade are among the architectural fragments housed in the vaults. 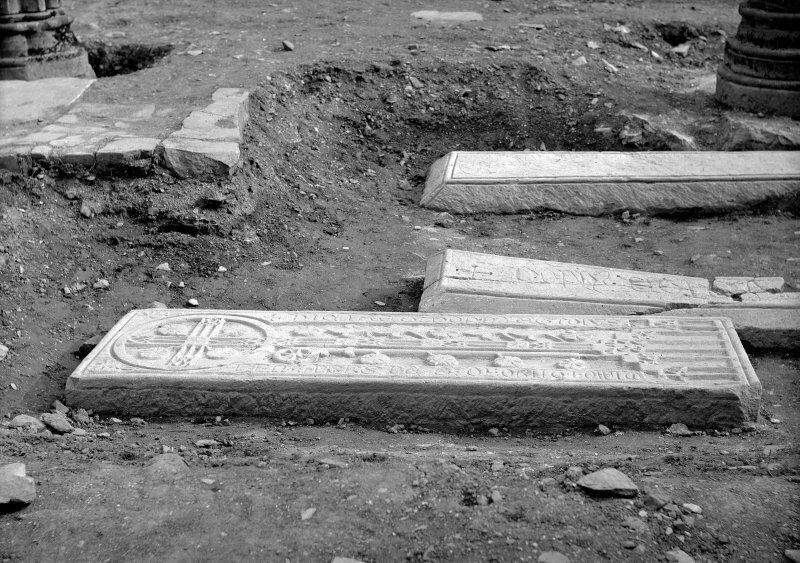 Early and mainly abbatial grave-slabs, including those with matrices for brasses, have been set into the renewed floor of the chapter house. 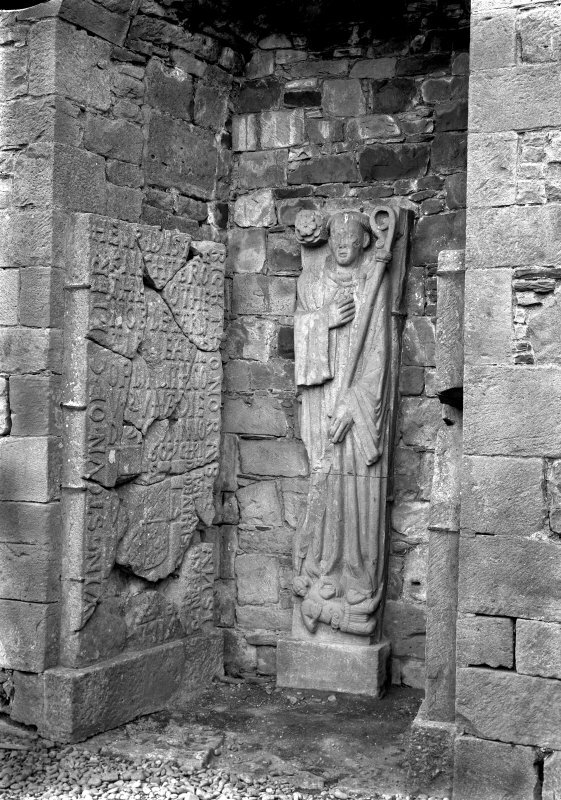 Two other monuments found in the chapter house, one an effigy of an abbot and the other (dated 1480) commemorating a cellarer, have been mounted in a recess, formerly a doorway, at the north-west end of the nave. 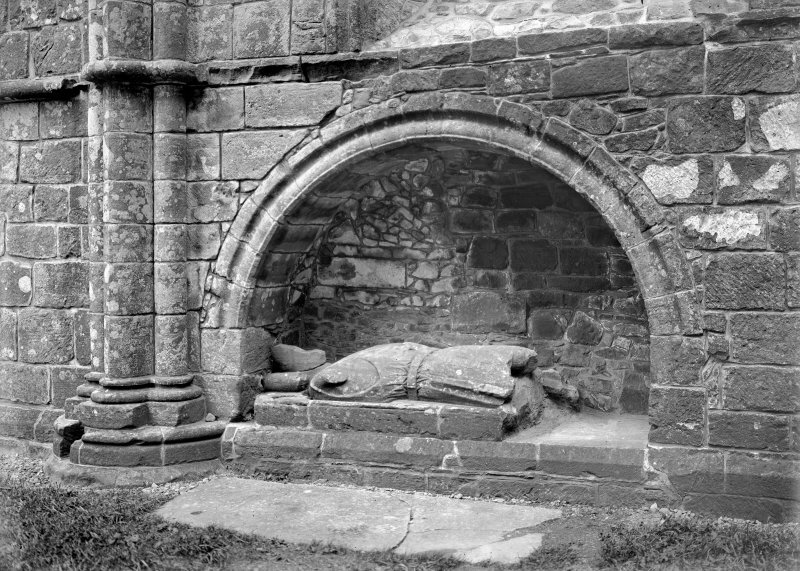 A tomb recess at the north end of the north transept contains a mutilated effigy of a knight, possibly of 13th century date and said to represent Alan of Galloway. 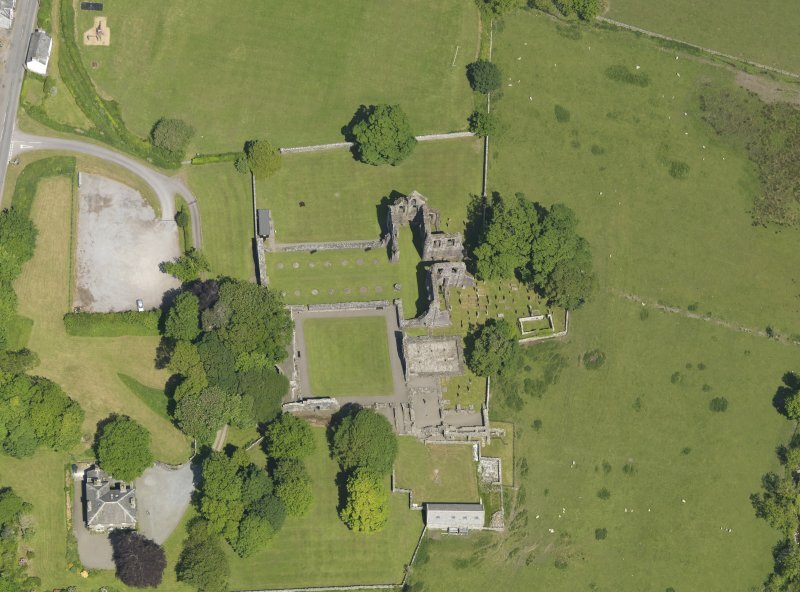 a) assess the archaeological potential of a conspicuous mound immediately S of the S abbey/manse boundary wall, which was causing the wall to bulge. b) Then remove completely that part of the 'heap' immediately affecting the boundary wall. The results of this exploratory excavation can be described in terms of the following periods of occupation/rebuilding. Fragmentary structural evidence was found within the earliest deposits revealed, of at least 2 buildings, elements of which were later totally removed, or absorbed into the Phase 2 layout. The evidence mainly comprised 2 external buttresses (F.025, F0.58) lying immediately S of an E/W aligned wall (F050, F024), apparently reflecting the earliest S limits so far revealed of the S claustral range, and a separate building of unknown function, lying to the S. The latter may well be associated with a great drain or series of drains known to exist in this general area of the site. Period 2: Major reconstruction of elements of the S Range: c1320-c1450 AD: The apparently extensive remodelling of the south range is characterised in the main, by the establishment of a new S wall (F.005), generally further to the S of the Period 1 structures revealed. This resulted in a plan comprising of 2 chambers (1 and 4 on Fig 4) forming respectively an access passage to the dormitory (Chamber 1) and the warming room (F.021), and a stone lined drain (F.022) running down to the S, about halfway across chamber 4. A further less substantial drain (F.023) lay to the W of the warming room, within what is assumed to be the dining hall. Chamber 4 was subdivided by the construction of an internal, crudely built wall (F.003), linking pillar F.040 with cloister wall to the N and S wall F.005. It is also likely that a doorway was inserted in wall F.011 to allow east access between the newly created chamber 1 and 2. The warming room (the new chamber 3) was thus reduced in size though still accessible from the cloister. Also during this period, much if not all of the internal faces of the walls forming chambers 1, 2 and 3 were plastered over. Period 4: Further conversion of the S Range for similar use: c1520-c1590 AD: The doorway between chambers 1 and 2 was blocked with distinctive clay-bonded masonry, and the threshold within the Period 1 doorway in wall F.002, was raised considerably. 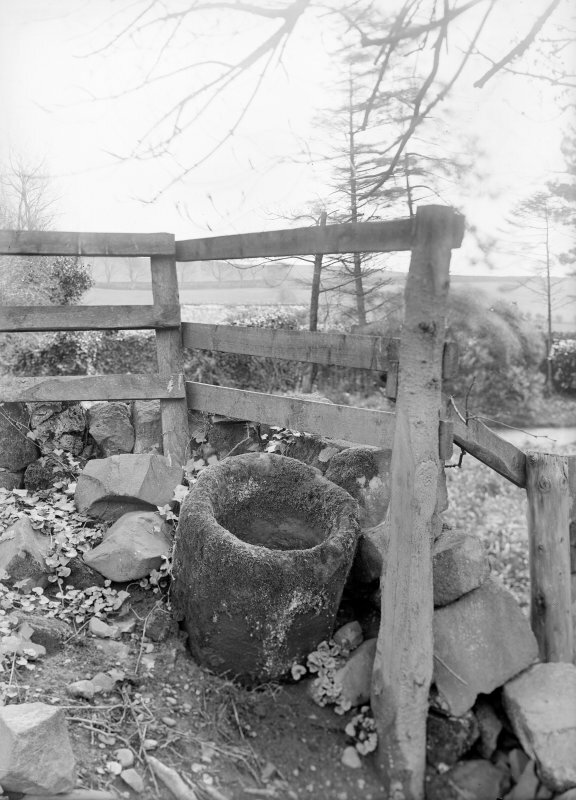 A bank of clay and mortar bonded masonry (F.063). These measures effectively cut off chamber 1, and major structures to the SE of the south range, from chambers 2 and 3 and the kitchen/dining room complex. Two earth and rubble banks (F.026, F.027) were then built against the W and S walls of chamber 3 although there is some indication that chambers 2 and 3 were unroofed or at least in some disrepair when chamber 1 was effectively screened off. 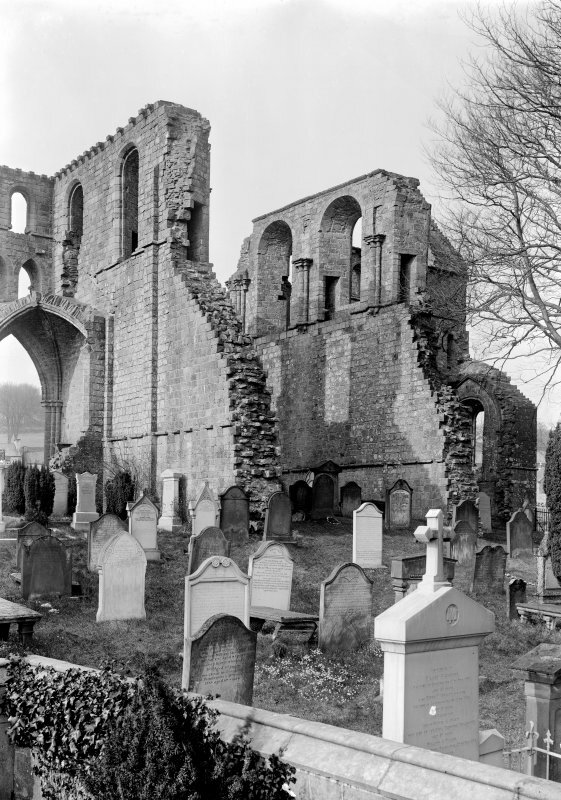 Period 5: Robbing of the major stone buildings within the Abbey: c1630-c1850 AD: The progressive and piecemeal dismantling of the abbey ranges while the church or parts of it at least, saw continued use up to the end of the 17th century, when the most useful parts of the structure were robbed. The remaining parts of the building were simply ignored. Period 6: The manse garden: c1850-c1910 AD: Once the new manse and its various outbuildings, driveway and elaborate garden, including large orchard, were planned, the final division between abbey and manse was fixed in terms of a boundary wall (F.007). 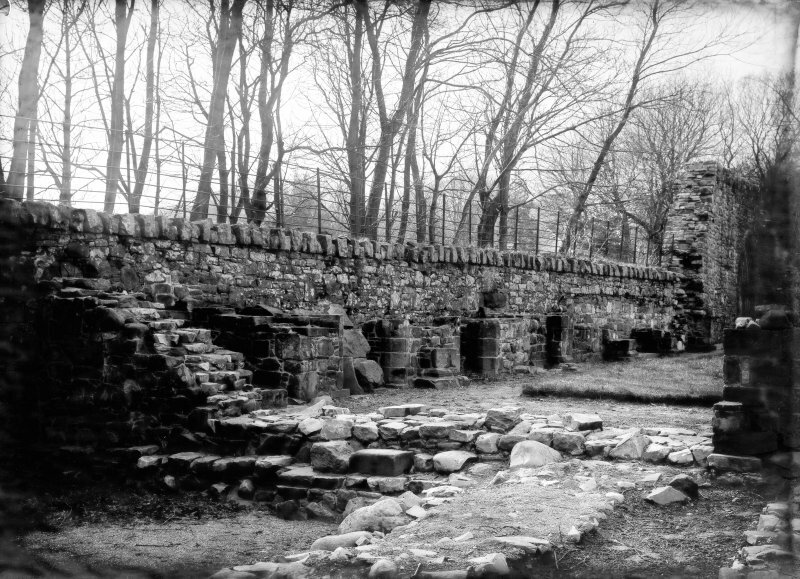 The residual rubble and ruined walls from chambers 1, 2 and 3 were then buried, further screening the manse property (specifically the stables) from the abbey grounds. 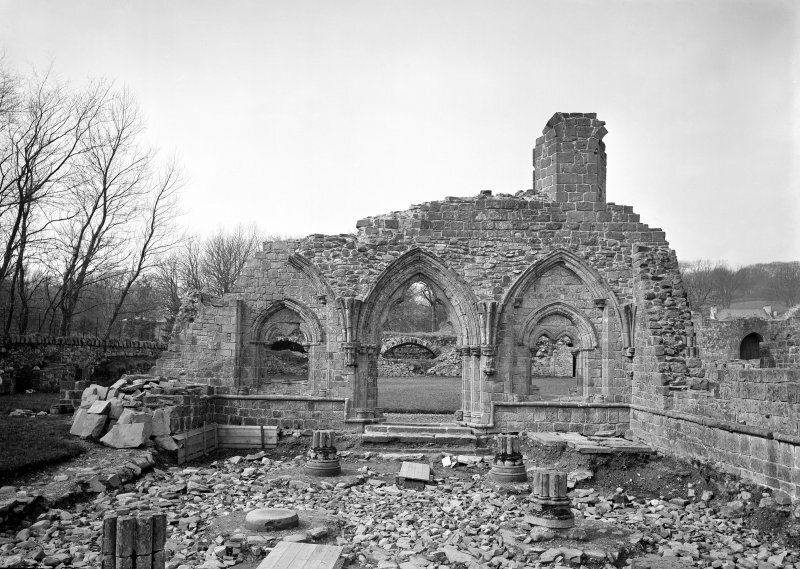 At this interim stage, the reason for the sequence of rebuilding and conversion can only be generally identified, however the radical rebuilding during Period 2, may well be a result of damage incurred during the Wars of Independence. 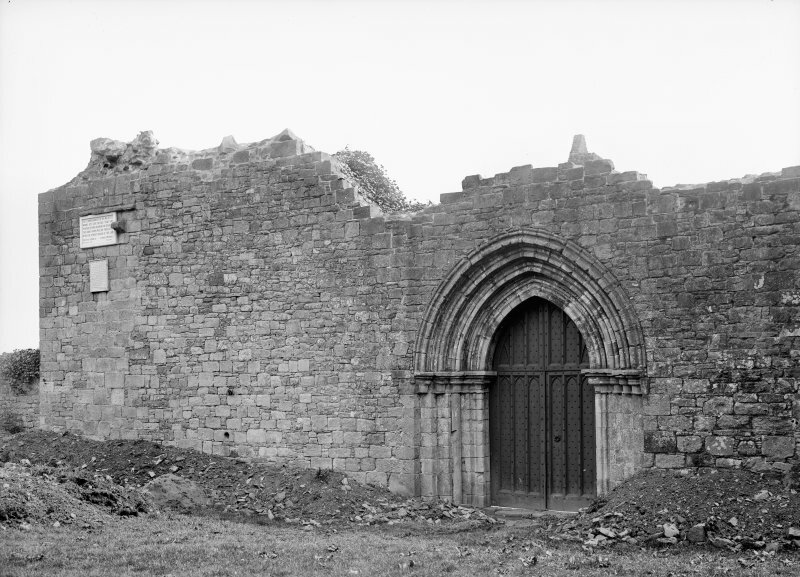 Similarly, the conversion of Chamber 1 to a cellar and the reinforcement of key walls during what was post-monastic occupation of the site, may well have been a response both to the household needs within the community, or the typical reoccupation of parts of the abbey complex, as individual private rooms or cells, towards the end of the 15th century. The 1992 programme of fieldwork was intended to extend the area already revealed in 1991, by removing approximately half of the remaining mound which covered elements of the SE corner of the claustral range. The work took place over fifteen days in May and June, with a small team and four days' use of a JCB. The results of the excavation ultimately appeared to reflect five periods of activity: Period 1: Colonisation and primary layout c1150-c1320. Period 2: Rebuilding and conversion c1320-c1450. Period 3: Subdivision of main rooms - conversion of drains to sewers c1450-c1520. Period 4: Conversion and blocking off doorways c1520-c1605. 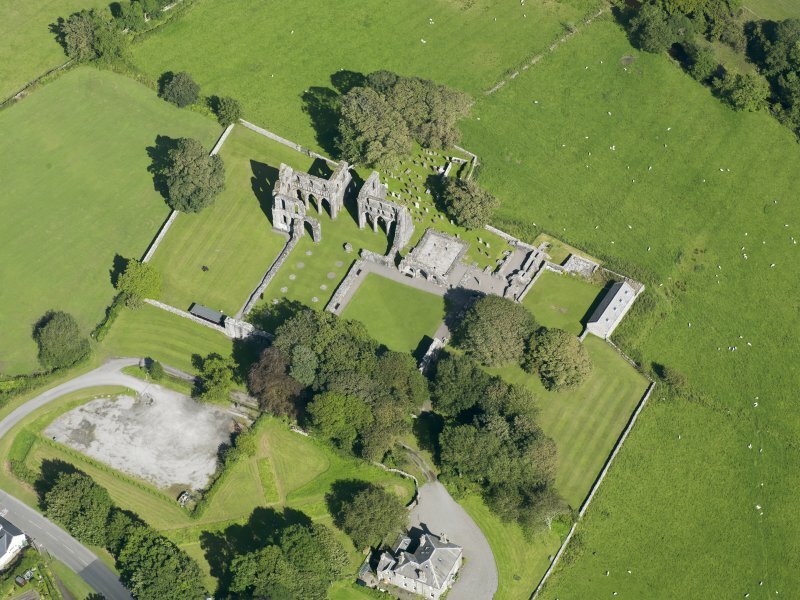 Period 5; Abandonment, demolition and robbing, creation of garden and early archaeological excavation c1605-1912. Period 1: The earliest feature revealed, reflected site preparation and parts of the 12th century layout - essentially wall footings and drainage features. Part of a wide stone platform or raft was found near the robbed E wall of the refectory. It comprised well-laid irregular whin-slabs (F.132 and F.142) with at least three simple drainage channels (F.143, F.144 and F.146) all running southwards, beyond the main S facade of the Period 2 structures. A short section of wall was found (F.115) beneath Period 2 wall F.002 re-used as footings for the latter and which respected the lowest floor within Chamber 4. 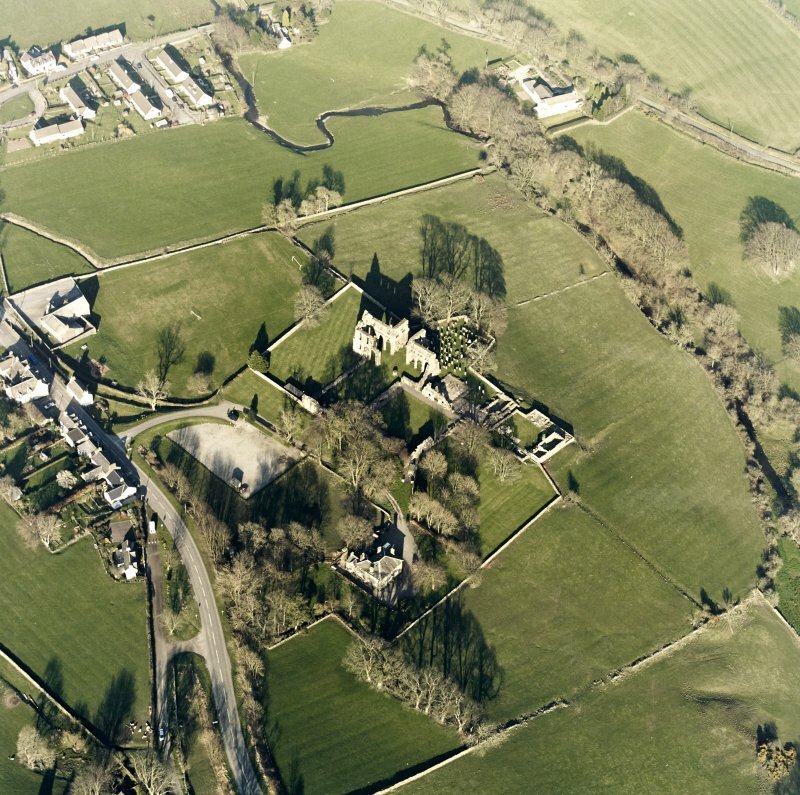 It is however uncertain whether this and walls F.050 and F.024 from 1991, which represent a completely separate layout, destroyed in the 1290s or whether they reflect an abandoned earlier incomplete plan, wholly obscured by 14th century work. One side of a vertically sided trench (F.100) was found 5m S of Period 2 wall F.080, aligned E/W, and which was abandoned and back-filled during Period 2. 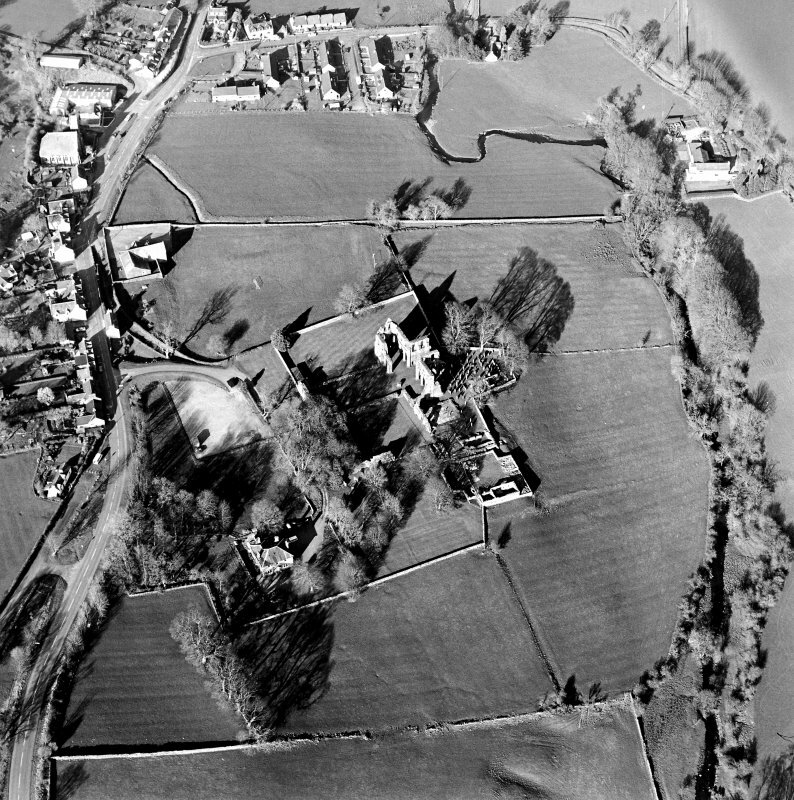 Although, at this stage its function is not certain, the primary fill of this trench did contain water-laid clays, implying that it was a drainage ditch, arguably used during the colonisation and early building phase of the abbey. 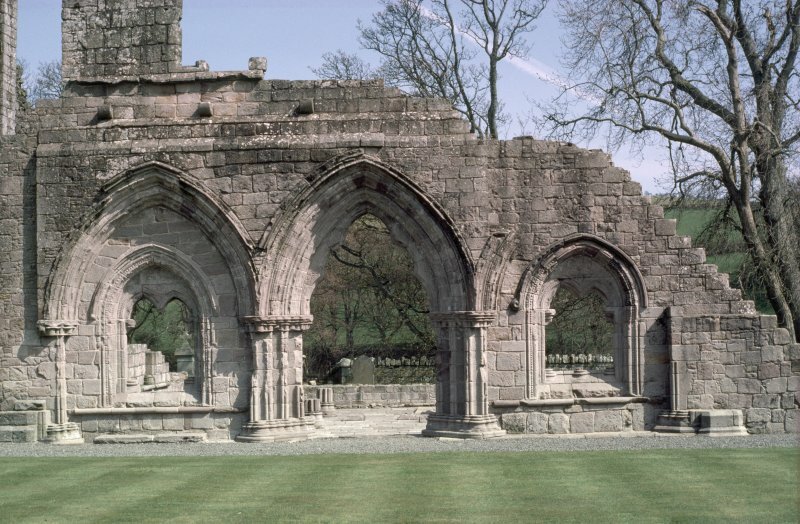 Period 2: This represents the bulk of 'monastic' activity within the SE corner of claustral ranges- the Warming Room, the Novices Day Room and the Reredo rter, all, for present, seen as part of the 14th century rebuilding of programme characterised particularly by the Chapter House. As built during Period 2, all three rooms were interconnected, but with only the warming room directly accessible from the cloister. All the main walls betrayed similar structural characteristcs - essentially, crude masonry banded with very sandy mortar. The inside faces of the walls were however heavily plastered, which in turn was probably painted. Externally, the walls featured a moulded scarcement but was relatively undistinguished in comparison with the high quality moulding noted on interior stonework - vaulting, door jambs, etc. This in turn may reflect separate quarry sources - fine grained softer stone alongside coarser types. However, preliminary survey work suggests that both stone types were available locally as coastal outcrops. 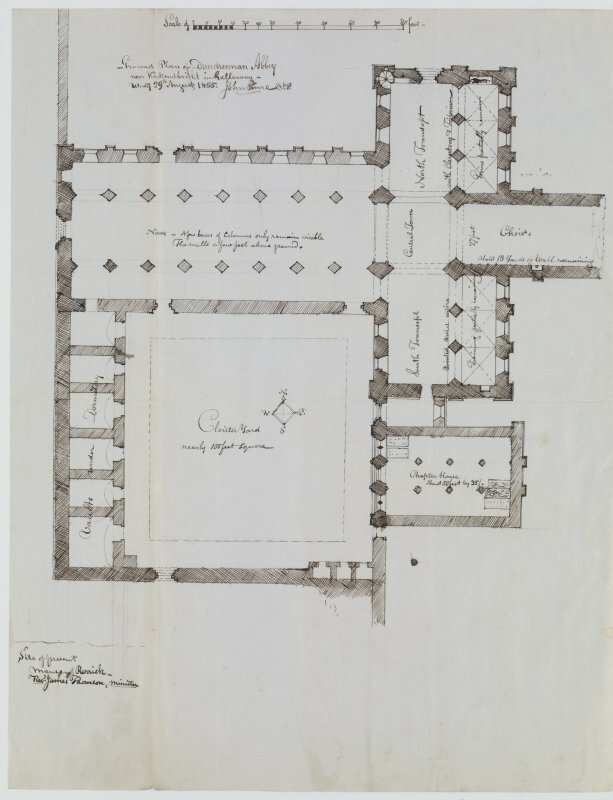 Period 3: This period is characterised by the general raising of levels inside and out chamber 4, apparently in order to a) bring the Period 2 floor level up to that of the cloister and Chapter House and b) to extend and convert the open drain (F.103) to a covered channel receiving outflow from two new garderobes (F.089 and F.090). This process coupled with the subdivision within the warming room and the partial blocking of the archway in the Reredorter, suggests more individual, cell-like occupation at ground level, with guest or possibly abbatical accomodation above. 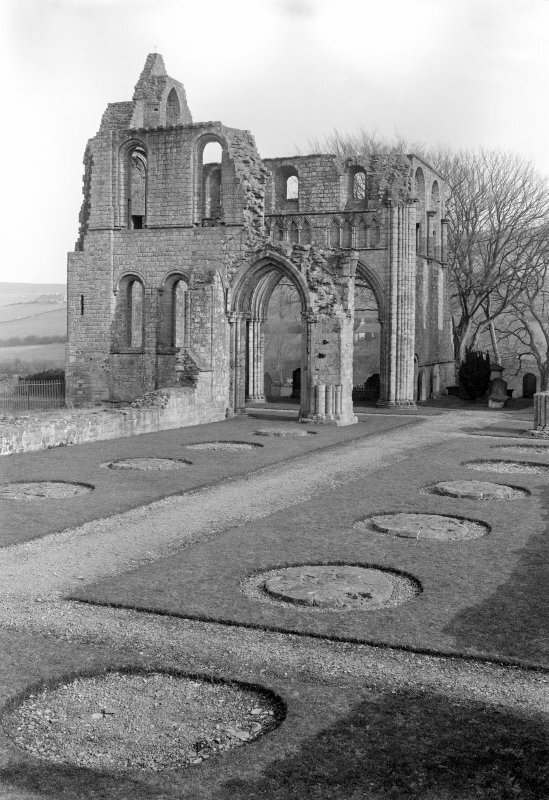 Period 4: This saw the final occupation of the site towards the end of the 16th century and is reflected by a) the final raising of the floor within chamber 4; b) the final blocking of the archway into the Reredorter, and c) alteration to the S window. By this time, access between Chamber 4 and Chambers 1 and 2 was no longer direct but via the passage (Chamber 3) which may may imply further separation of usage, perhaps storage as opposed to residential use during the 16th century. 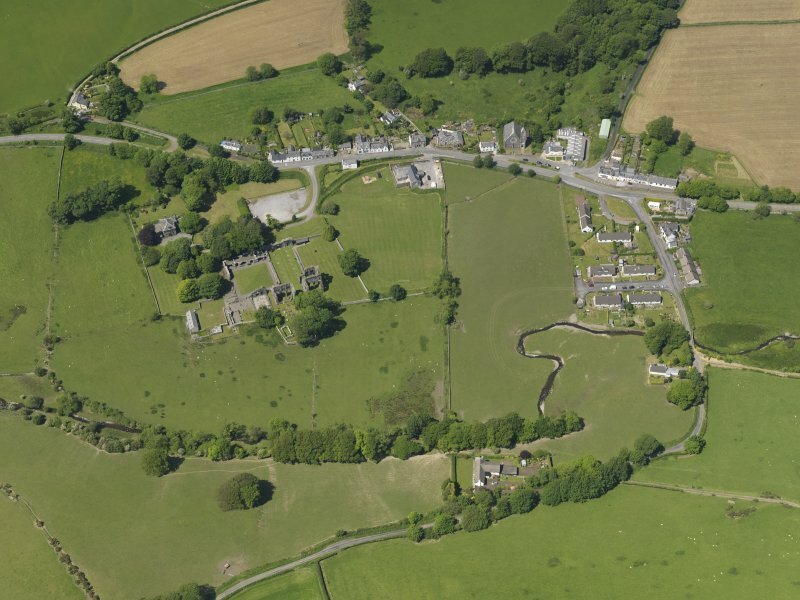 Period 5: The site was ultimately comprehensively robbed of building stone - probably in a steady sequence from W to E culminating in the construction of the first manse c1743. 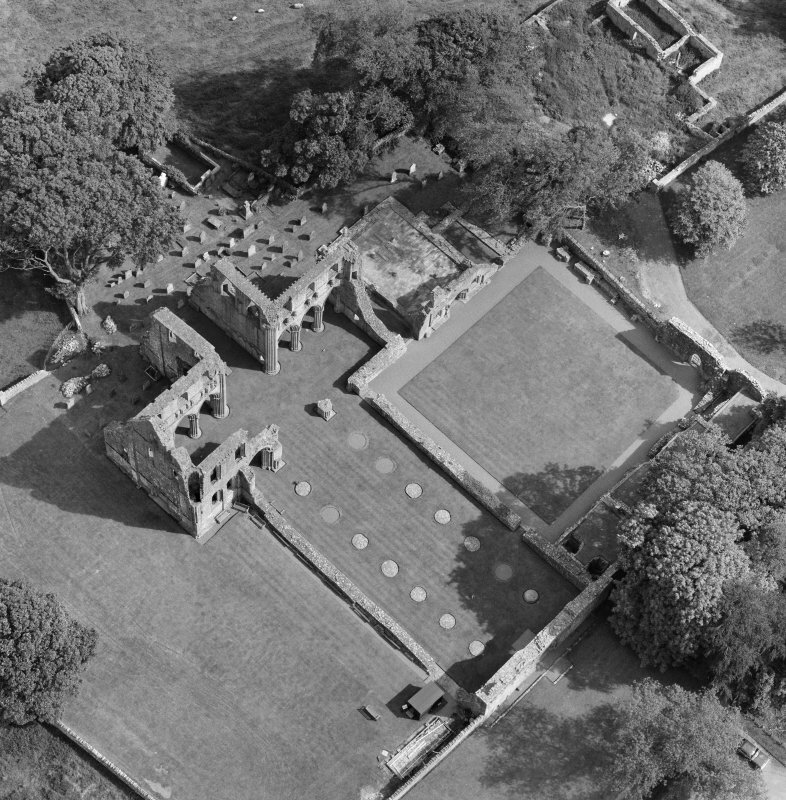 The gradual improvements to the manse and its grounds reached a peak towards the end of the 19th century when the stables and garden were laid out. 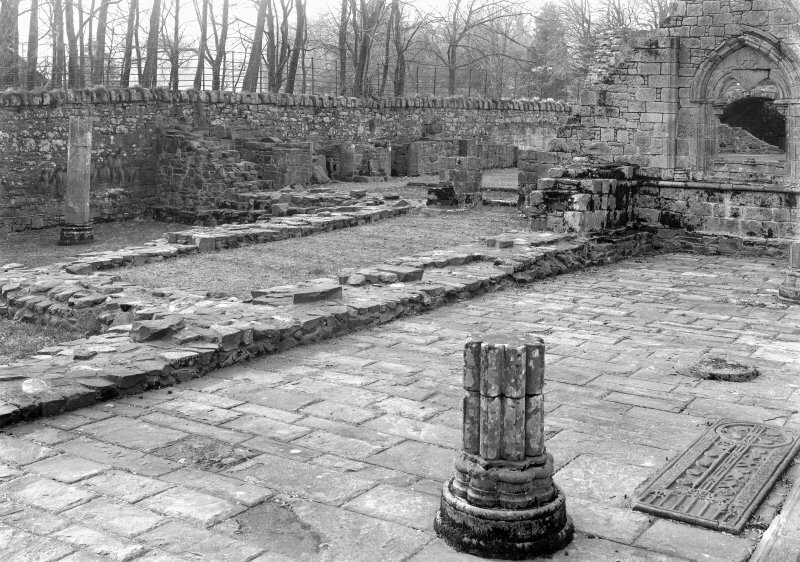 At this time, Chamber 4 at least, was buried and landscaped to form a simple terrace on one side of the stable yard. 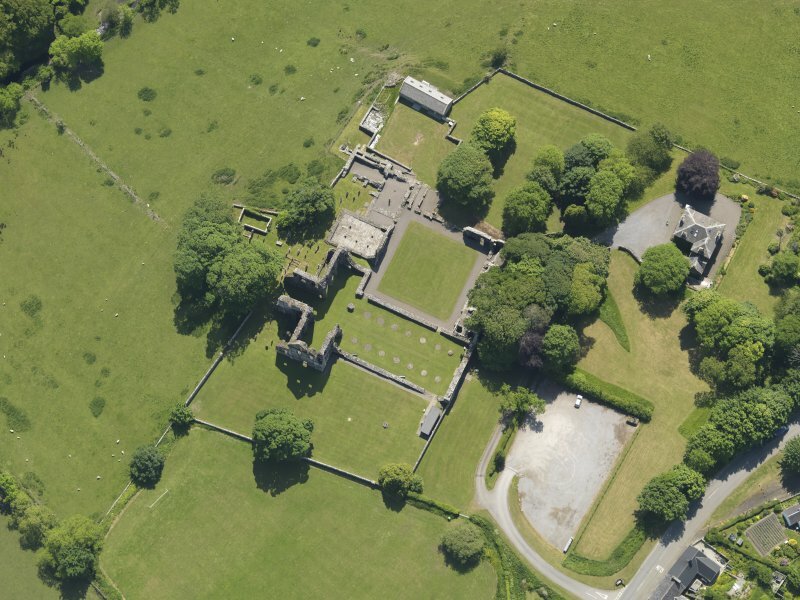 The stables were part of a range of buildings around a cobbled courtyard, the S and E limits of which may well derive from monastic terracing and may even reflect Period 3 and 4 abbey buildings. Elements of the S range were excavated in June 1993, during which the W half elaborate undercroft beneath the latrine block/reredorter at the extreme SE corner of the claustral circuit was cleared of robbing collapse. 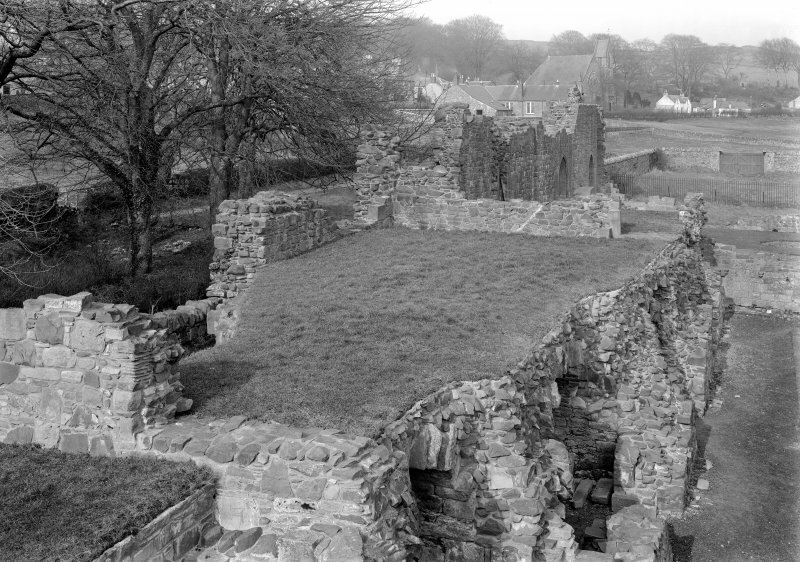 The evidence so far clearly shows that this structure and the adjacent Novices' Day Room were part of an integrated complex of high status changers dating from the early 13th century. The two rooms were built from the same artificial terrace and were linked by an extremely finely constructed ornamental archway inmplying easy access and possibly allied function. 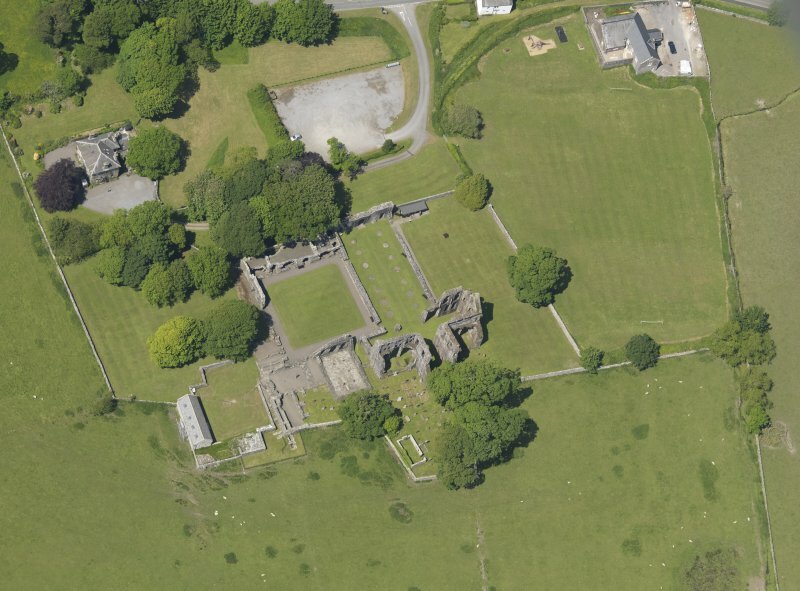 One possible explanation for the newly-discovered chamber is that it was the abbey infirmary, as in Margam Abbey, Glamorgan. Over 130 fragments of moulded stone - mainly from the vaulted ceiling of the chamber - were retrieved from the excavation, having apparently been discarded when the site was robbed regularly from the late 17th century. Clear evidence was also found of a period of subdivision and structural repair within the S range, with the blocking of the W door and infill of the massive garderobe slots in favour of smaller garderobe pits. 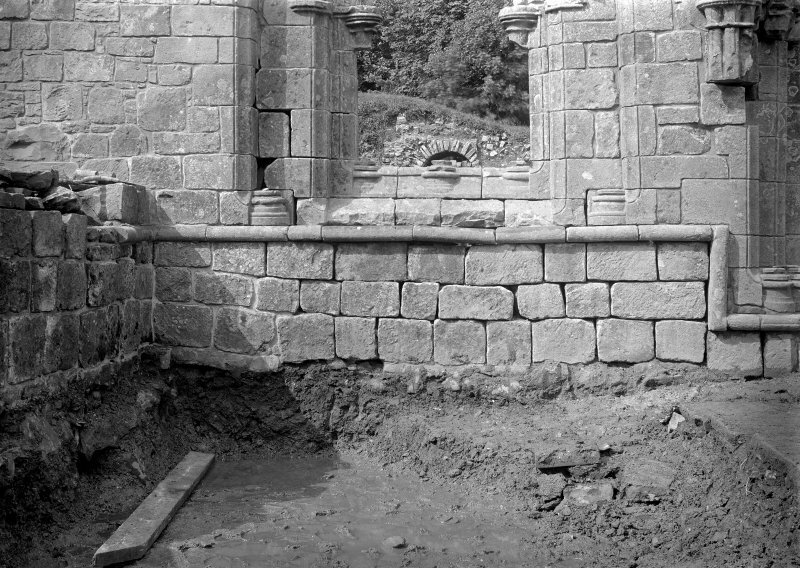 All this is indicative of a reduction in the communal occupation of the cloister, perhaps in response to subsidence or partial collapse of the southern walls of the range, which necessitated reinforcing the S walls by blocking redundant garderobe chutes. NX 749 475. A watching brief was maintained in November and December of 1994, during restoration work on the S wall of the Reredorter undercroft and the associated great drain. Remaining fill of the drain was excavated, once the masonry was stabilised. 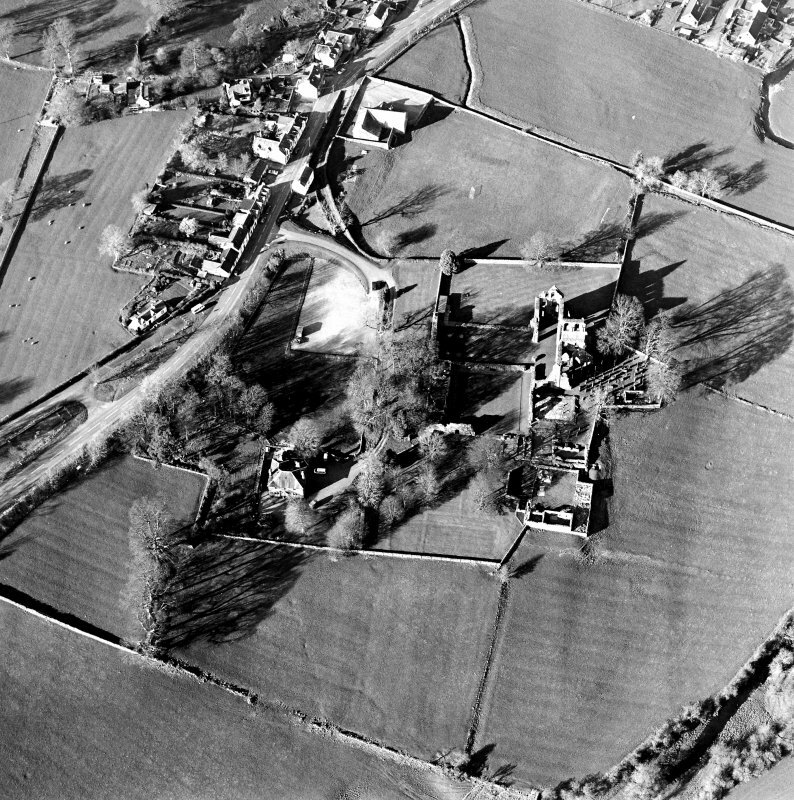 NX 7492 4750 Six trenches were excavated by Kirkdale Archaeology in the field lying to the E of the abbey after the completion of a resistivity survey. Only a small number of anomalies were located which could not be accounted for as rig and furrow remains. The remaining anomalies were tested by trial trenching, and proved to be ambiguous, due to the stony nature of the subsoil. 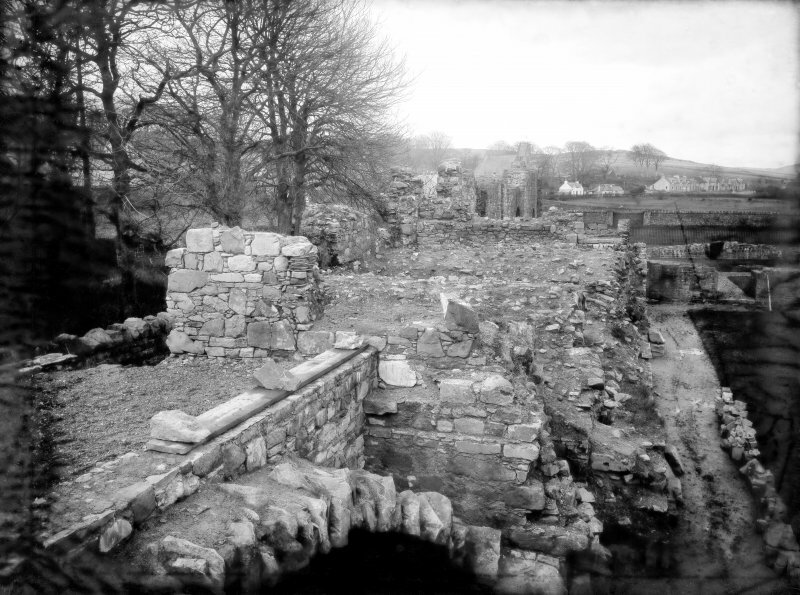 At the same time, a survey was made of a bridge over the Abbey Burn, to the NE of the survey area. 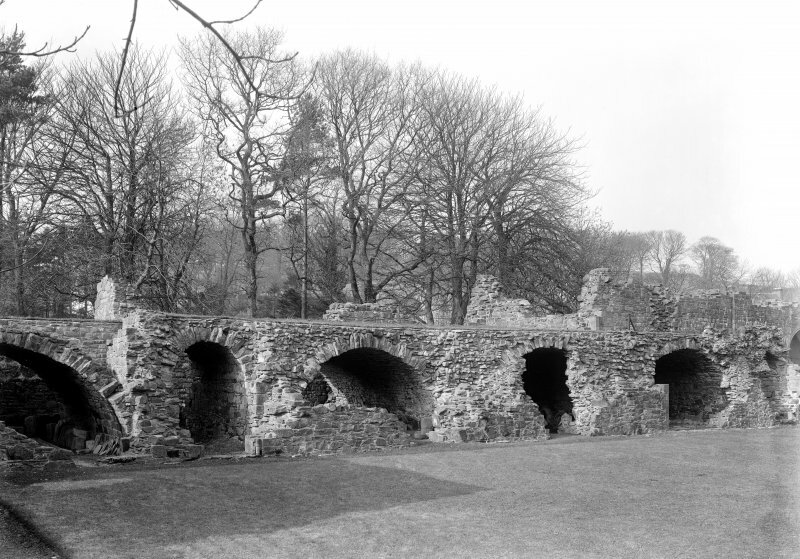 The bridge proved to be post-monastic, and probably post-medieval in date. NX 7492 4750 Following the removal of the boundary wall between the previously public area of the monument and the excavations in the old stable yard to the S, Kirkdale Archaeology was engaged in July 1997 to supervise and conduct the removal of material so as to allow visitor access between the two areas. Although the level of excavation carried out was minimal it has served to show both the probable survival of archaeological deposits at shallow depth in the old public access area, and the further complexity of the structures comprising the S range. G Ewart and J Triscott 1997. NX 7492 4750 A watching brief was carried out at Dundrennan Abbey in October 1999 during the excavation of drain trenches. 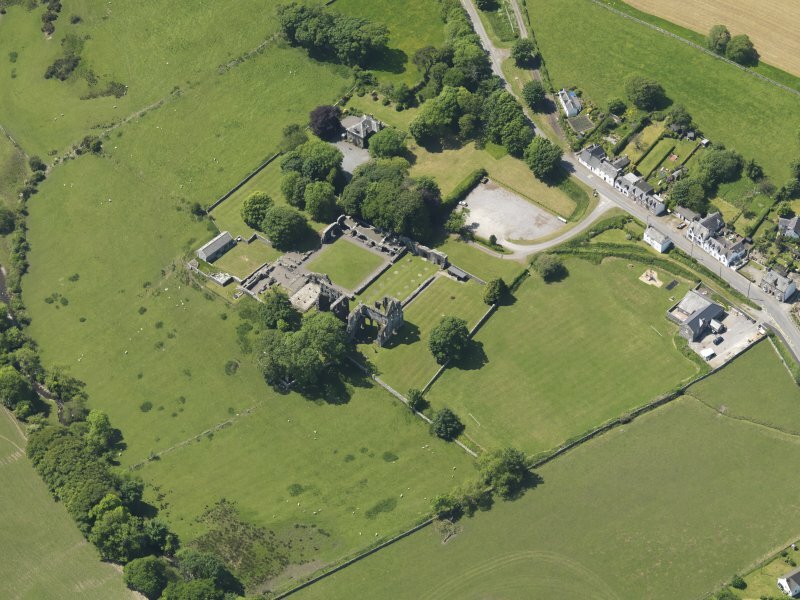 The first trench measured 82m long and was cut through the field separating the abbey burn and the abbey outbuildings at their SE corner. A second phase of pipe trenching was carried out 22m to the S of the earlier works, in order to remedy an incorrect alignment in the initial trench. The excavations revealed the E extension of the monastic drain. The newly excavated section was 5m from the centre of the last surviving capstone partly uncovered in a previous excavation. The maximum visible width measured 1.6m N-S, and the whole was buried under 1.3m of debris at the W end and 0.25m of field topsoil at the E end. 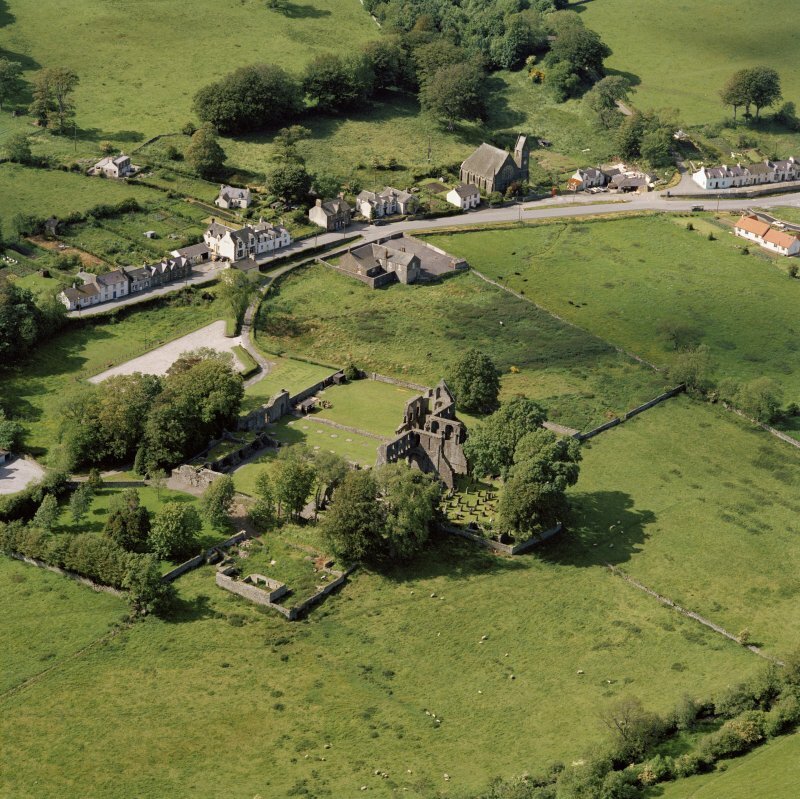 A watching brief was carried out at Dundrennan Abbey while Historic Scotland personnel cut a series of post holes for a new fence line situated around the E end of the main monastic drain. The drain exits into the field above the Abbey Burn at a point between the steadings and the burial ground. The fence line made up three sides of a rectangle with a total length of 32m. 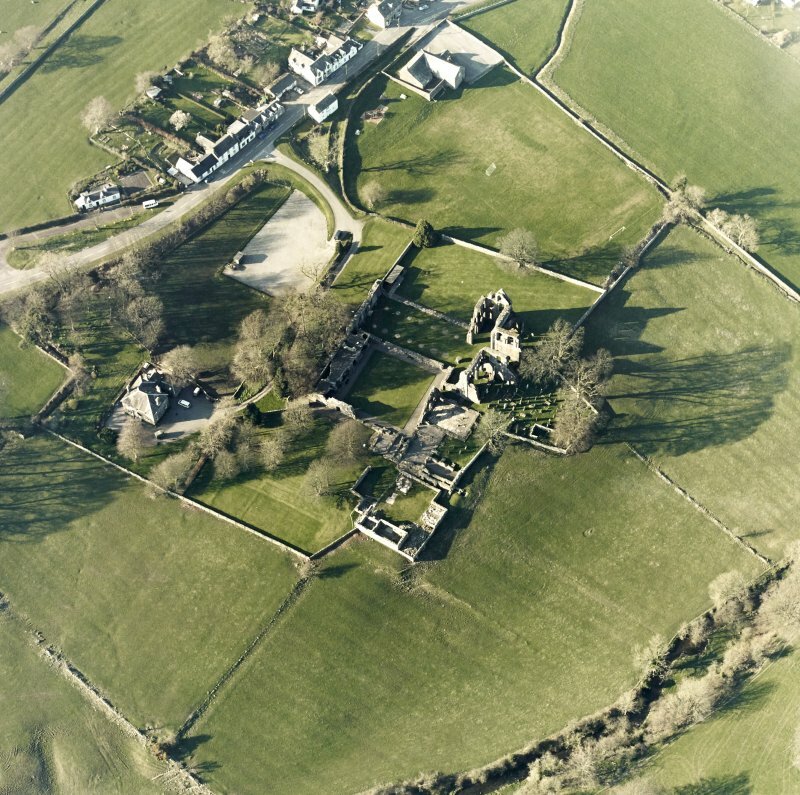 The line began with a 4m stretch running E-W from a point 8m from the N end of the steadings wall; the line then turned N for a further 20m before turning W for a final 8m at which point it joined the monastic wall 5m N of the medieval drain. The fence required 7 deep post holes and 26 shallow post holes, these last being set at 1m intervals between the larger holes. 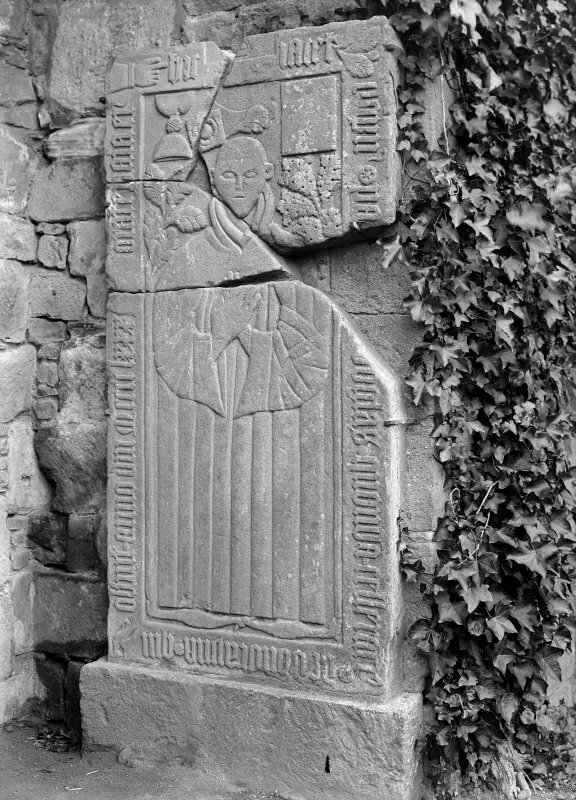 NX 748 474 During 2003-4, a second inventory of the substantial collection at Dundrennan Abbey was begun as part of the Ex Situ Carved and Moulded Stones Project (DES 2003, 7-10). 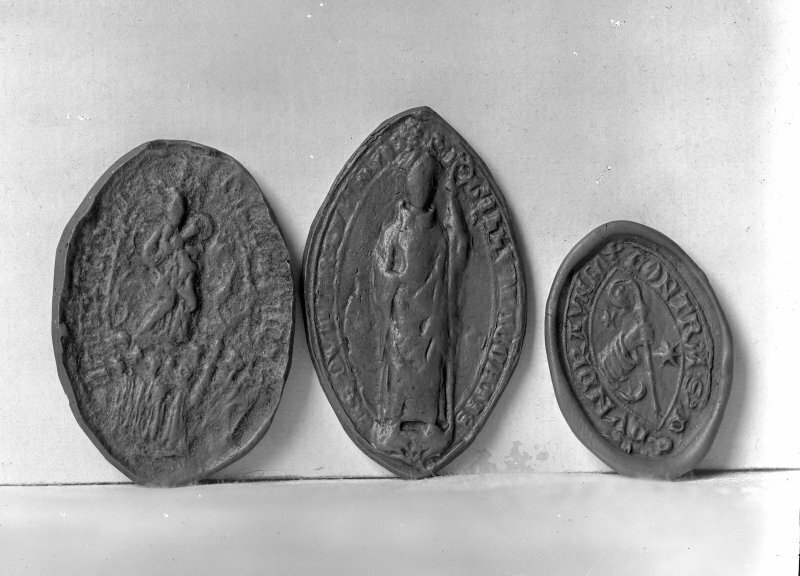 This large collection is presently stored in various locations at the abbey. The stones catalogued so far are set out in the vaulted cellars on the W side of the cloisters. A number of corbels remain in the collection, many of which have parallels still in situ, with one piece resembling the mid-12th-century corbels in the N transept, where they support wall shafts. A further group of seven corbels are related to those above, for example the E and W walls of the N transept, the N and S choir walls, and the E wall of the S transept, and are dated to the mid/late 12th century. One large group of carved stones forms part of a wall arcade, and many of these have been set up around three walls of one cellar. The nail-head ornament with which these stones are decorated is typical of the type of ornament found in the abbey in the mid/late 12th century, where it can be seen on capitals and around doorways. Some large ex situ fragments probably came from the 13th-century chapter house. No vaulting remains in this large three-aisled vaulted space, but springers in the western angles have ribs with a similar profile to those of two large free-standing vault springers now in one of the cellars. Another two fragments in the same cellar are vault bosses, and the ribs of these are related to those of the two springers, and therefore also to the chapter house vaults. Inventory October 2003 onwards; 230 pieces catalogued by September 2004; 12th-15th century; NX74NW 12. Archive held by HS and in the NMRS. See also www.arch-etype.net. 39), was continued. This large collection is presently stored in various locations at the abbey. The stones covered so far are set out in the vaulted cellars on the W side of the cloisters, with some additional items retrieved from a sheeted area to the SE of the cloisters. New storage benches have been set up in the cellars, and this has enabled the collection to be rationalised, with stones being grouped according to their function. Many of the stones catalogued during 2005 were found during archaeological investigations by Kirkdale Archaeology in the early 1990s, and a large proportion of these are vault ribs and their springers, with one or two related keystones. 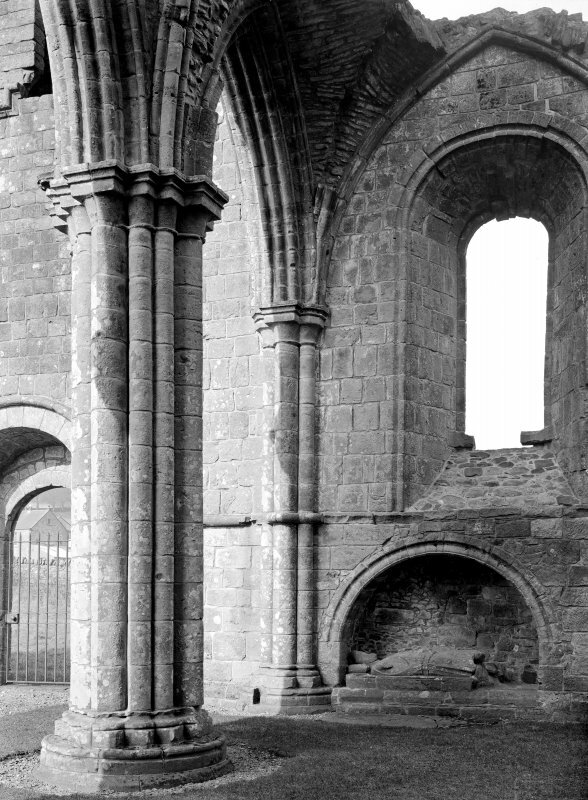 The ribs are very simply moulded with chamfered corners, and from the remains of the monks' day room with its octagonal column, vault ribs of this type were probably used here and in neighbouring areas. This large group of ribs can be sub-divided into three groups, according to variations in the basic dimensions of width and depth and, unlike most of the other stones in the collection, there are many masons' marks remaining. Another interesting fragment has a rectangular socket in its upper surface, and has panels of decorative low-relief carving on all four sides (one rather sketchily worked). The underside is roughly worked flat around the edges, with the central area more roughly finished. 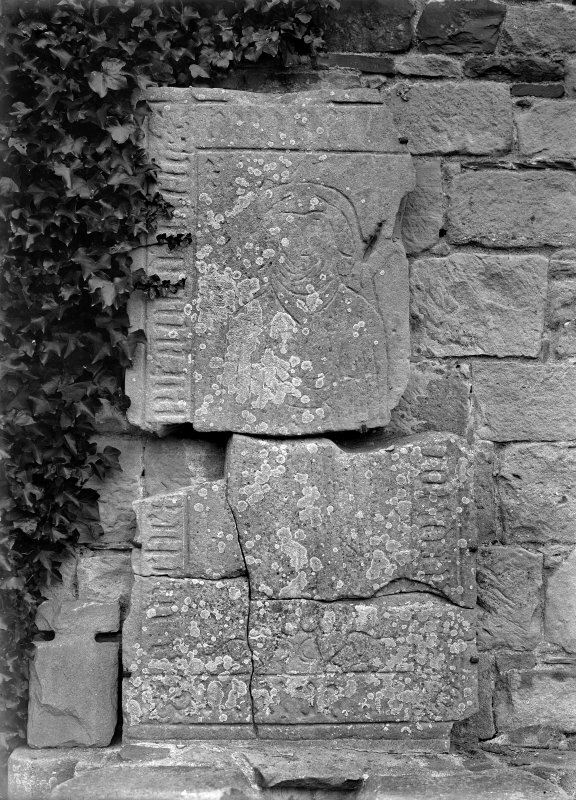 This may once have supported a vertical element such as a cross, with a projecting section on the underside (now broken away) to stabilise the stone. Inventory: October 2003 onwards, still continuing; 520 pieces catalogued by November 2005; 12th-15th century; NX74NW 1. Archive held by HS and in NMRS. 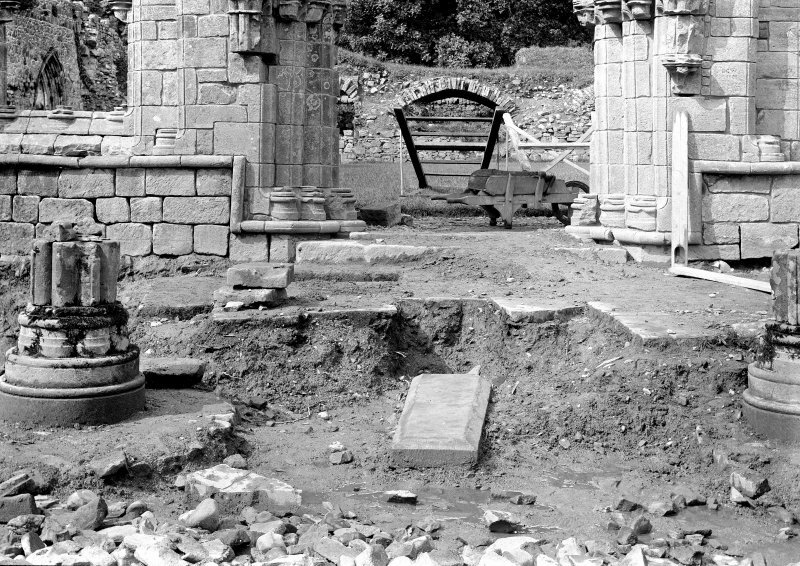 NX 7489 4750 A watching brief was undertaken during the excavation of a drainage trench along the W frontage of the abbey church and the W range of the cloister. The machine-cut N-S aligned trench would stretch from the main entrance to the abbey church southwards for 50.5m before tying into the local main drain near the E entrance to the Maitland House gardens. 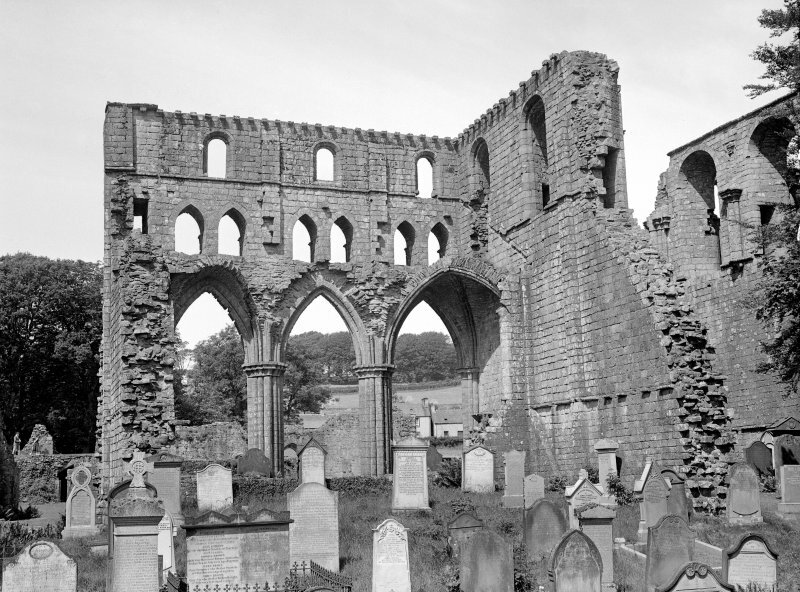 The extensive robbing of the abbey appears to have removed peripheral structures almost entirely. The site of the narthex in particular, half of which was trenched by these works, appears to have been almost entirely robbed away, with internal levels removed down to natural deposits by stone salvage and modern drain insertions. No structures or original features other than those already visible were exposed by this extensive operation. Archive to be deposited in NMRS. Sponsors: HS , Kilmadock Development Trust. 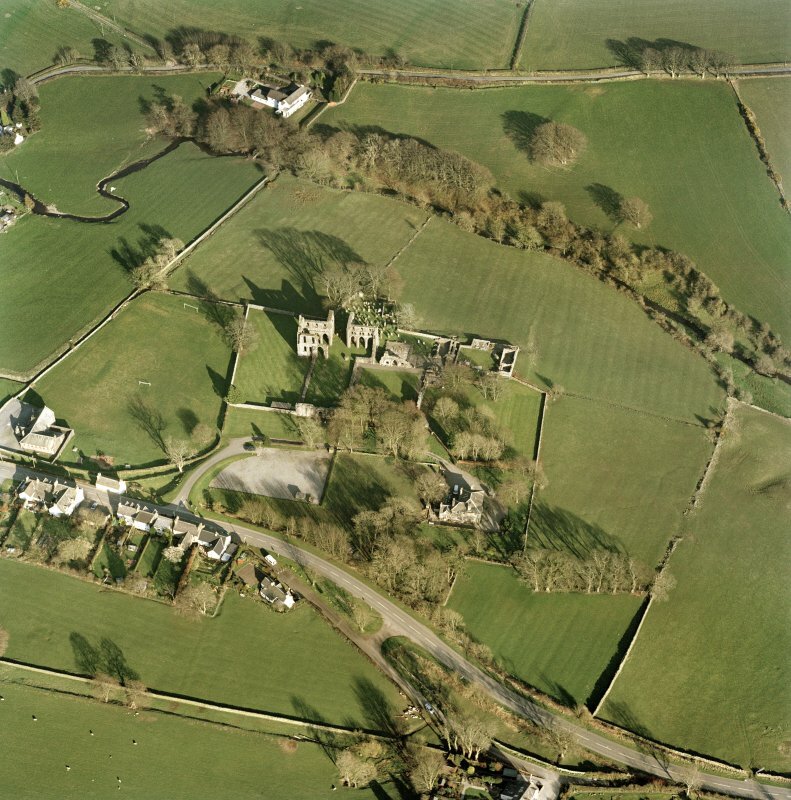 During 2004-5, the inventory of a large collection of carved stone at Dundrennan Abbey, begun in 2003, was continued and completed by late November/early December 2006. This collection is presently stored in various locations at the abbey. Most of the stones recorded this year were retrieved from a sheeted area to the SE of the cloisters, but also included some that were set out in the vaulted cellars on the W side of the cloisters. 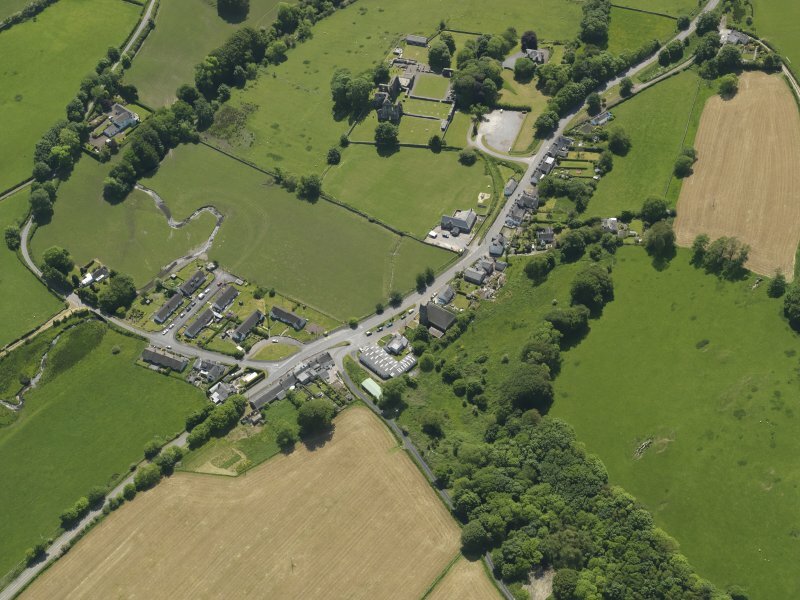 Almost all the stones catalogued during 2006 were found during archaeological investigations by Kirkdale Archaeology during the early 1990s. A large number of these are vault ribs and their springers dated to the late 12th to early 13th century, together with one or two related keystones. As mentioned in last year's report (DES 6, 2005, 47-8), the ribs are very simply moulded with chamfers, and from the remains of the monks' day room with its octagonal column, vault ribs of this type were probably used here and in neighbouring areas. This large group of ribs can be subdivided, according to variations in the basic dimensions of width and depth, into four groups, and, perhaps surprisingly for such relatively simple carved stones, they present a plethora of masons' marks. In addition, a significant group of stones has emerged which are now believed to be part of a choir screen. These stones are large, and had previously been thought to have come from the cloisters, but when the group is examined as a whole the screen function becomes much clearer. A large stone with decorative carving probably came from the upper section of an arched opening. The outer face is carved with four fleurs-de-lis contained within a circle. 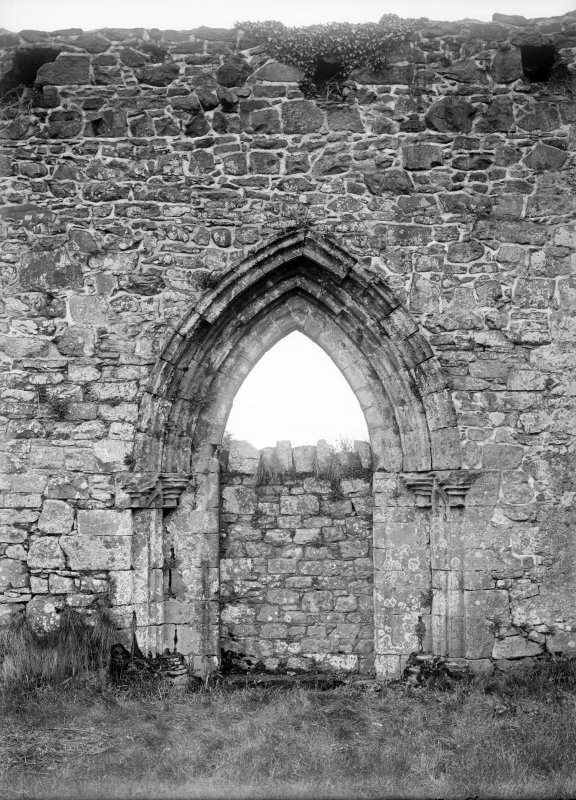 The stone has tapering sides and could therefore have occupied the spandrel of a window arch, as can be seen in situ, in the two (rebuilt) W window arches of the chapter-house, dated mid-13th century. NX 7493 4744 and NX 7494 4746 Trenches were excavated to the N, E and W of the stable block (NX 7493 4744) to tie the new roof drainage to an existing stone-capped drain crossing the site on 18 March 2008. 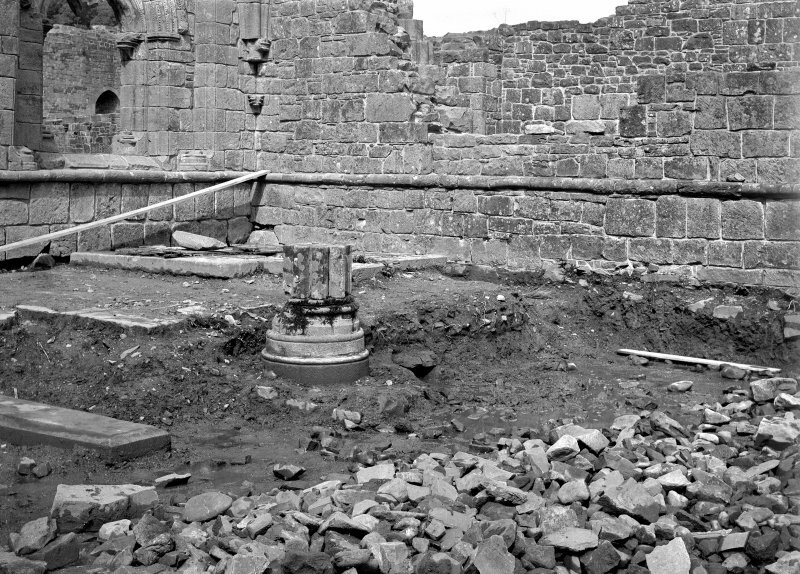 Further trenches were dug to install a new railing fence around a monastic drain and to install concrete ramps at the doors to the stables (NX 7494 4746). The excavation revealed a complex series of surfaces and levelling deposits. NX 749 474 (centred on) A series of eight small holes, linked to the installation of survey points, were hand-excavated in the grounds on 18 September 2008. The holes were each 170mm2 and not more than 130mm deep. Gravel-rich deposits below the topsoil suggested turf had been introduced and carefully laid over levelling. NX 7489 4752 A watching brief was carried out on 30 March 2012 during the excavation for a trench for a new sign. There were no finds or features of archaeological significance.